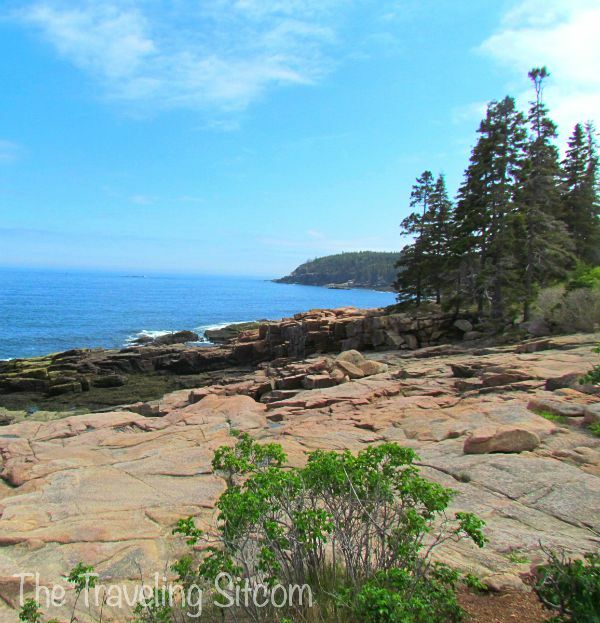 Top 9 Things to See and Do in Bar Harbor! We are now on our way south, heading to St. Petersburg, FL for our winter destination. 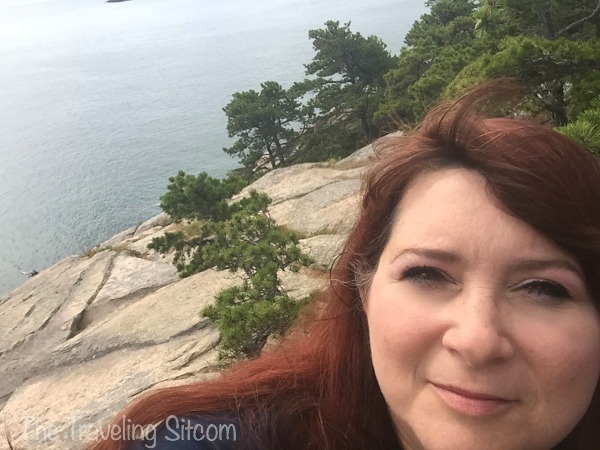 I wanted to put together a final post on the beautiful area of the country that we had the pleasure of living in- Bar Harbor, Maine. Well, I have the answers for you, at least from our point of view. 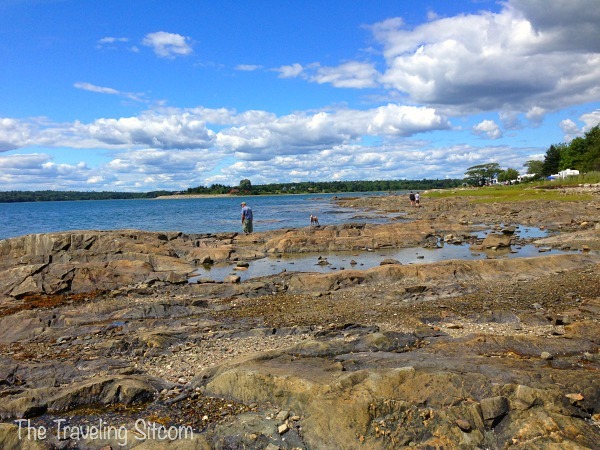 These are the things that you should really not miss if you ever get the chance to enjoy the coast of Maine. 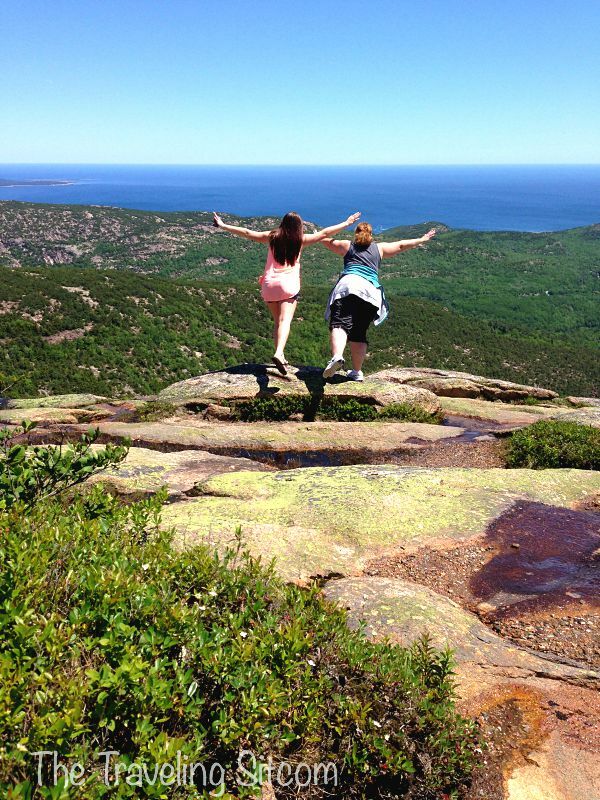 Cadillac Mountain is located in the nearby Acadia National Park and at 1,530 feet, it is the highest point along the North Atlantic seaboard. There are various hiking trails to the summit, some more challenging than others. There is also a paved road to the top. From the summit, you can see most of Mount Desert Island. On a clear day, it is a beautiful site to see! 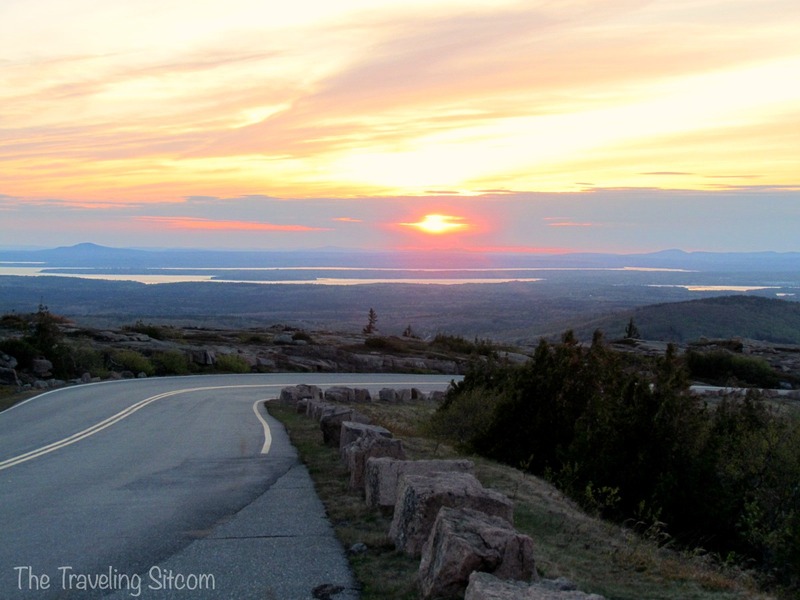 At certain times of the year, Cadillac Mountain is the first place in the United States to see the sunrise. Getting up to see a sunrise from the top of the mountain is a common attraction. Sunsets there are beautiful too. Schoodic Point is the only part of Acadia National Park that is located on the main land of Maine rather than on Mount Desert Island. 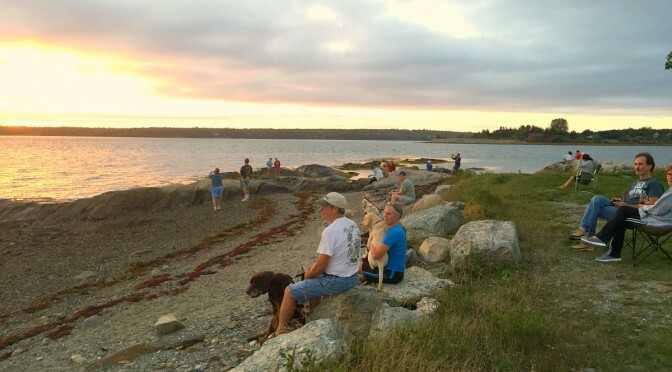 For that reason, Schoodic is a much more secluded, less crowded opportunity to actually see some wildlife. Because of the fact that it is located away from barrier islands, you can enjoy the crashing of the waves from an unobstructed Atlantic Ocean. 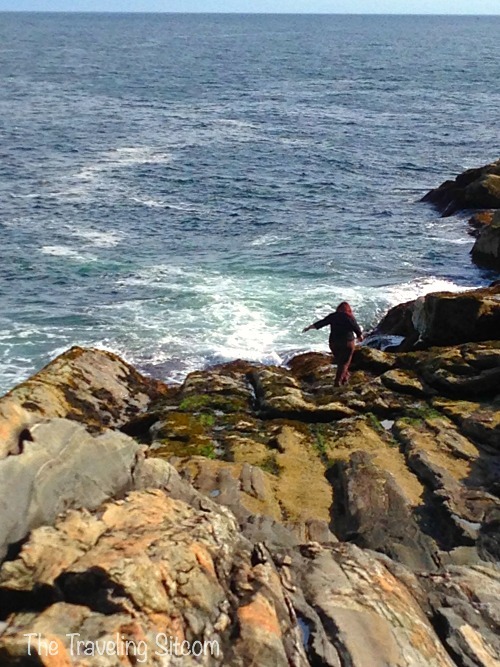 It is about a 45 minute drive from the tip of Mount Desert Island, but well worth the time. From Schoodic, you can see the peak of Cadillac Mountain and enjoy another beautiful Maine sunset. Schoodic is where we ran across several huge porcupines. I’d say they were as big as my VW Bug, but I’d be exaggerating just a tad. Suffice it to say, they were huge! 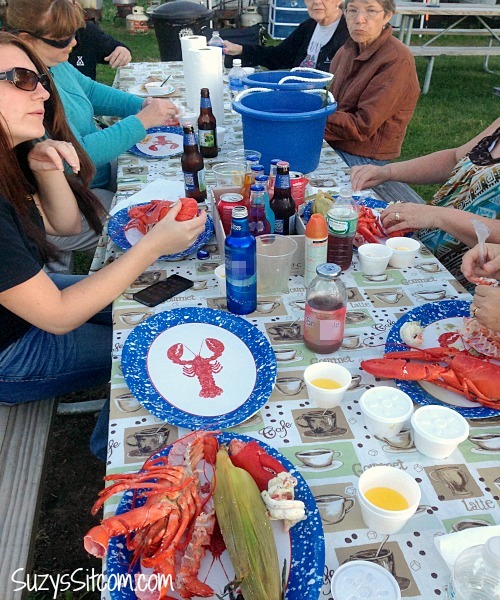 Trenton Bridge Lobster Pound– in Maine, any place that sells lobster by the pound is called a Lobster Pound. Imagine that. There are many of them all over Mount Desert Island and the mainland. They all compete with each other, sell similar items and their prices are very similar depending upon the varying prices of lobster. Trenton Bridge has the advantage of a great view and awesome Maine atmosphere. 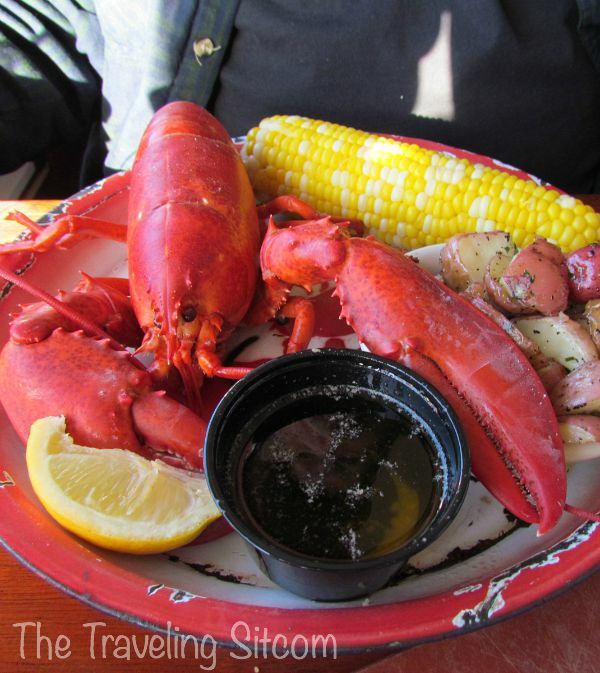 Chart Room Restaurant– This restaurant is located right along the water on Route 3 headed toward downtown Bar Harbor. Because they are not downtown, they are not usually as crowded as those in Bar Harbor. You can eat right on the water and the food is just amazing. Loved their Stuffed Haddock. 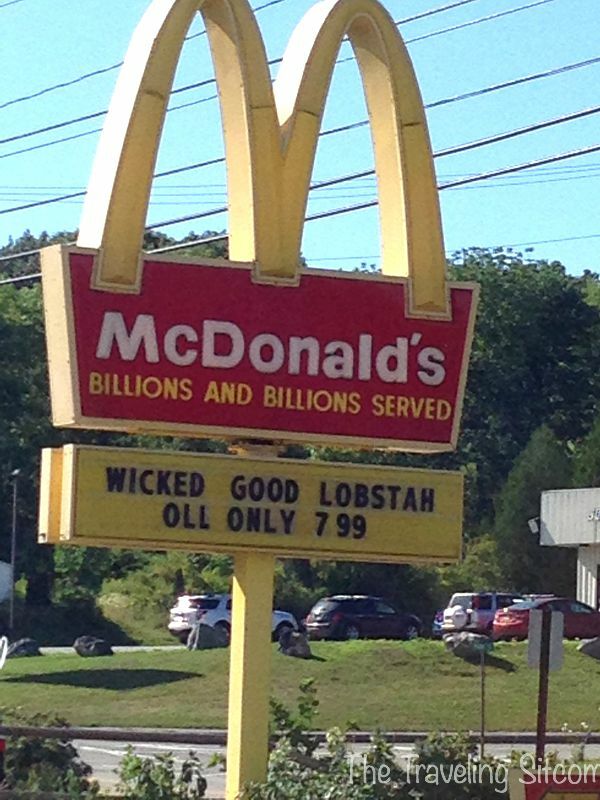 They also serve steak for those of us that are a bit tired of seafood, and of course, lobster! Ben & Bills Chocolate Emporium located on Main Street in Bar Harbor has lots of fun flavors in their homemade ice cream selection including Dulce de Leche, Bubblegum, (KGB) Kahlua and Baileys Irish Cream base ice cream with a Grand Marnier fudge swirl, Rum Raisin, Root Beer Float, and many more! 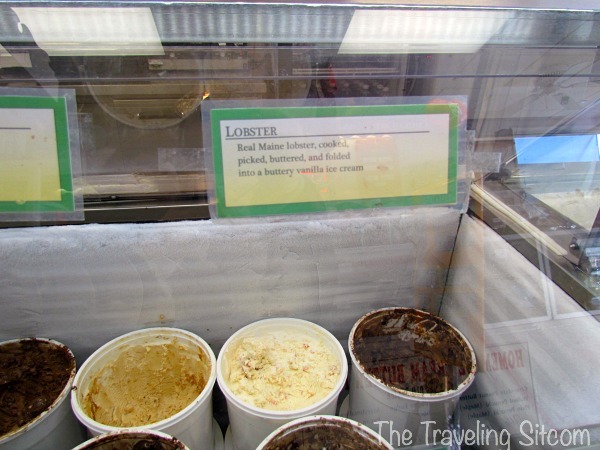 Oh, and Lobster icecream! Yes, I tried it. Imagine butter pecan with little chunks of meat in it… yeah, that. I have to say that it wasn’t my favorite, but at least I can say I tried it! Ha! Blueberry Hill Dairy Bar- If you love soft serve, good prices and lots of ice cream for money, you can’t beat Blueberry Hill Dairy Bar. 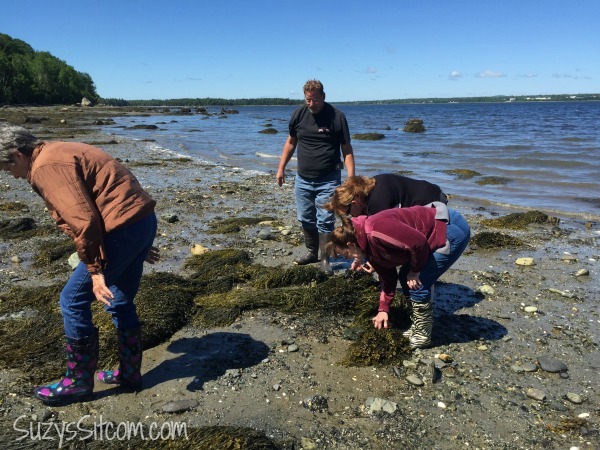 It is located off of Mount Desert Island in the little town of Ellesworth right on Route 3. It was one of our most frequent stops when going back and forth to Ellesworth for groceries. While the ice cream is fabulous, the folks that worked there never seemed to like their jobs much. I have to say it was a very surly group of individuals. Cash only. No samples. Make sure you know what you want when you get to the window. In spite of the help, the ice cream was awesome! And well worth the stop. 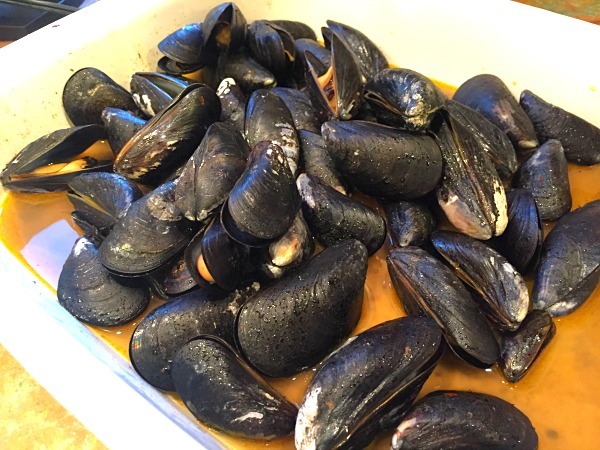 Hadley Point is a great place to go if you love mussels. 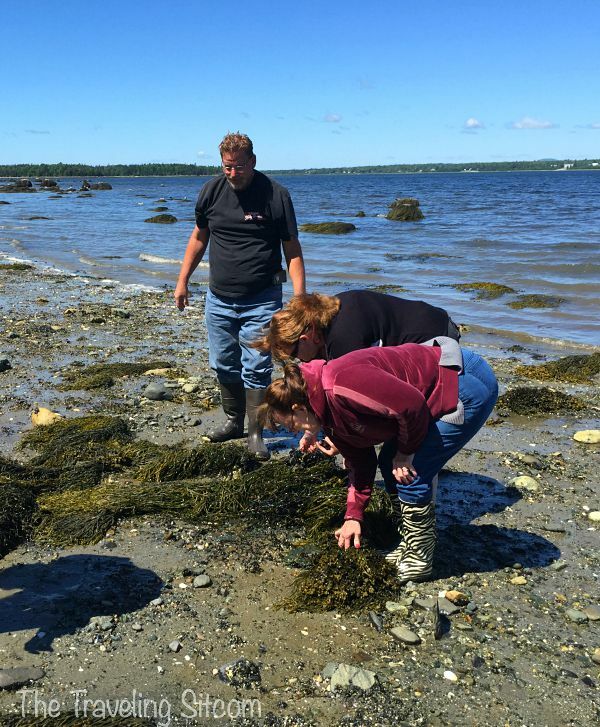 In the state of Maine, you do not need a license to go mussel fishing. Simply wait until low tide. 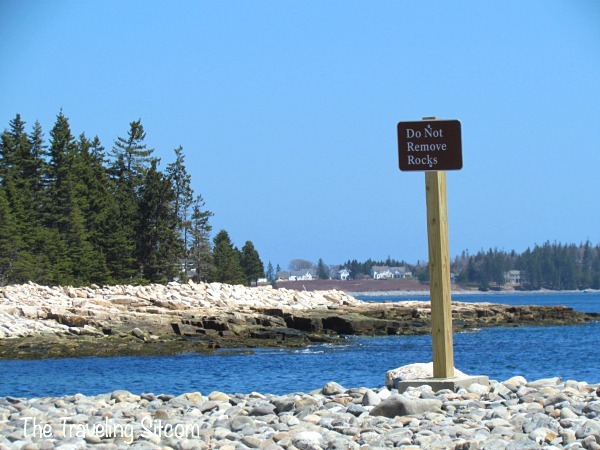 In Maine, the tide drops 10 to 20 feet depending upon where you are. This leaves quite a bit of the seaweed covered rocks exposed. Put on some boots march out there, and start lifting up some of that seaweed. Underneath you will find mussels! Place them in a bucket of salt water, add about a cup of cornmeal and let them sit overnight, stirring them and adding fresh water every now and then. This will get them to spit out any sand. Rinse them and then either steam or boil them with garlic. 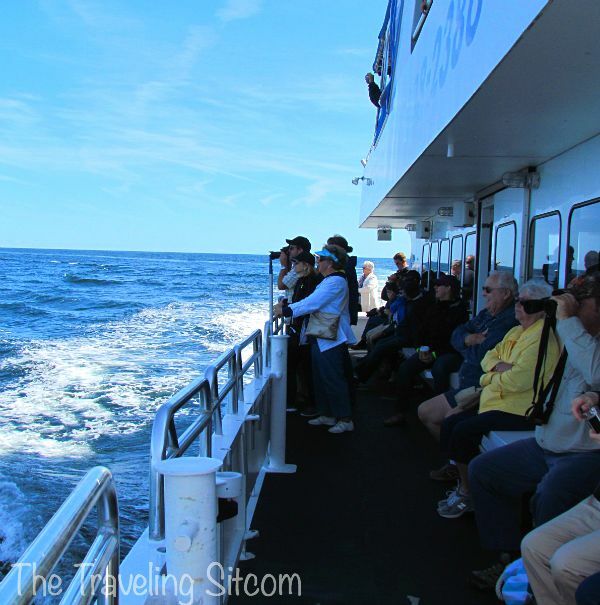 The town of Bar Harbor is the base for many different boat tours including Whale Watching, Lighthouse Cruises, Wildlife cruises, Schooners, Lobster Fishing and more. Well, we think they all have their good points. Pricing can be as much as $50 per person, so be prepared. Decide what you would best enjoy and take advantage of the opportunity to get out on the water. You will love it! Oh, and take a warm jacket and some anti-motion sickness meds with you just in case. It is at least 20 degrees colder out on the water and windy too! 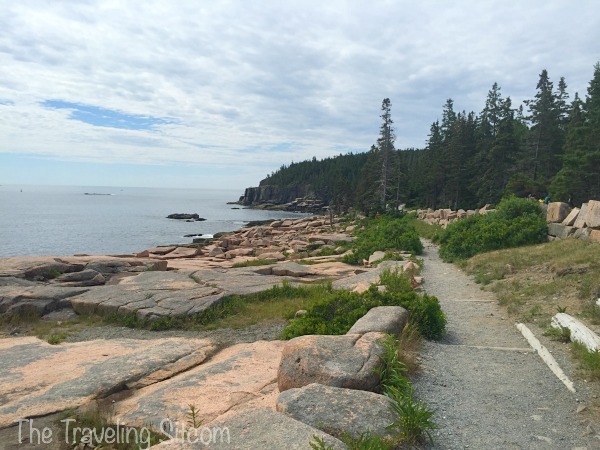 Acadia National Park offers much to do including hiking, biking, kayaking, rock climbing, and more. For those of us that love to watch nature in action, it is a fabulous place to go. 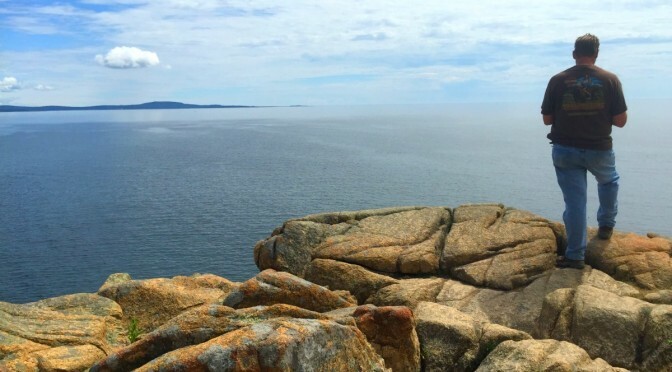 The Acadia Park Loop is a 27 mile road beginning at the Hulls Cove Visitor Center (near Route 3 on the northern side of the island) and connects the Park’s lakes, mountains, forests, and rocky coast. Want a chance at seeing a moose? Head about 2 hours northwest of Acadia to Baxter State Park in central Maine. It is worth the trip. Miles and miles of wilderness where the opportunity to witness wildlife is at its best. 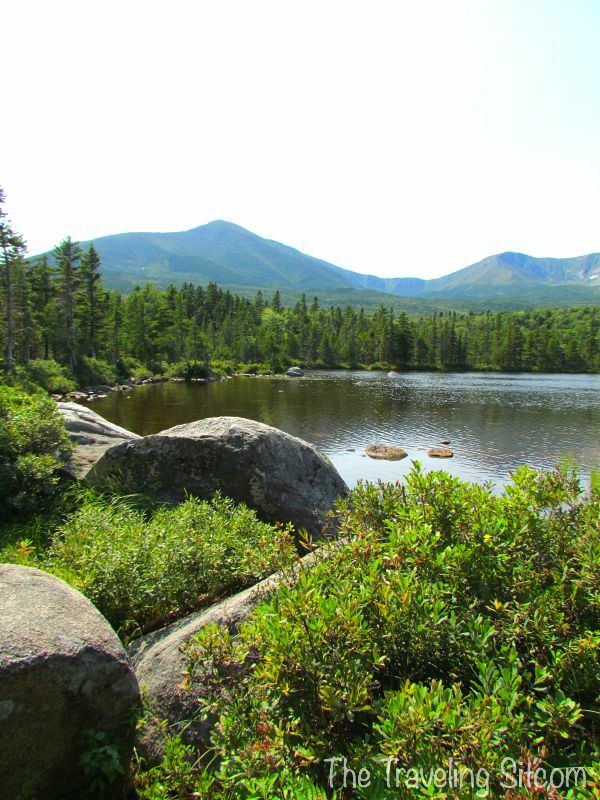 If you love to hike, you can climb to the top of Mount Katahdin which is Maine’s highest peak at 5,267 feet (1,605 m). This mountain is also the northern terminus of the Appalachian Trail. Some things to note: Baxter State Park has restrictions- no pets, no RV’s, no motorcycles, no large trucks. It is remote, so little to no cell phone coverage. 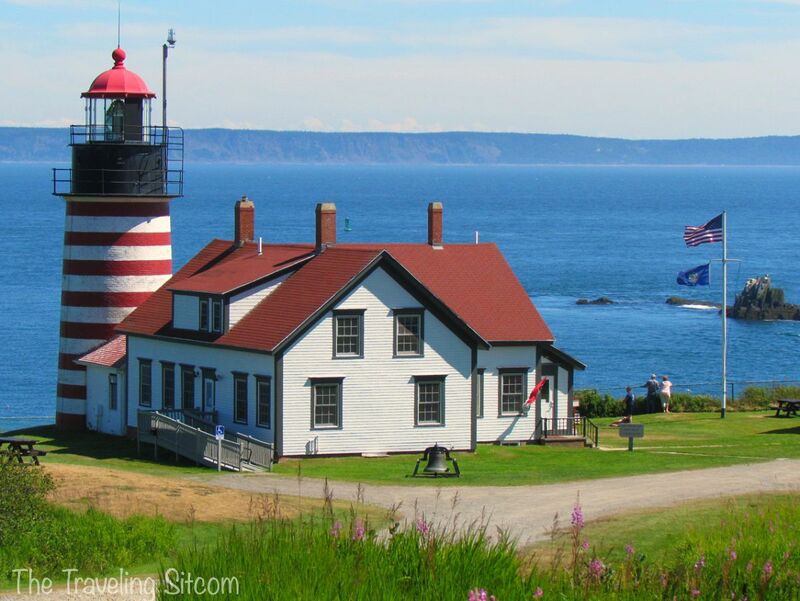 The little town of Lubec is the home of the beautiful West Quoddy Head Lighthouse. 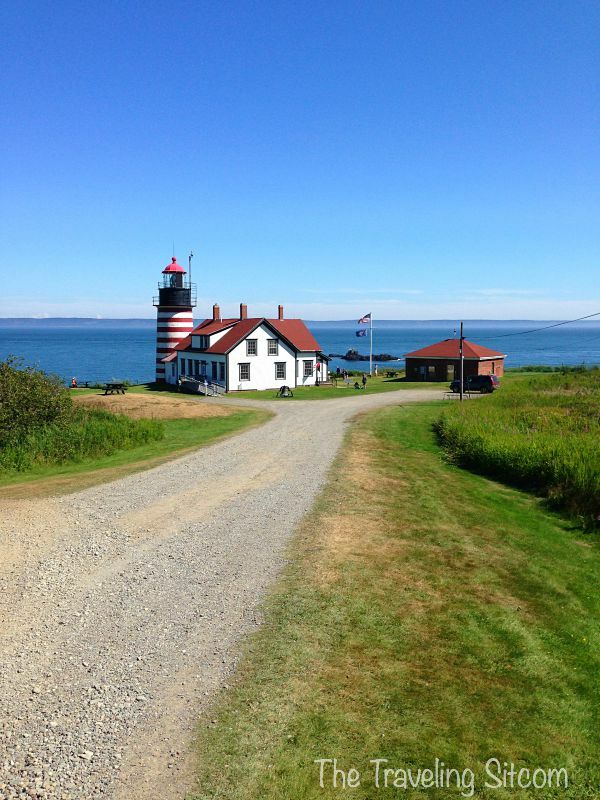 But even more interesting, Lubec is the easternmost town in the contiguous United States. Since we have already been to Key West (the southern most point); it seemed fitting! 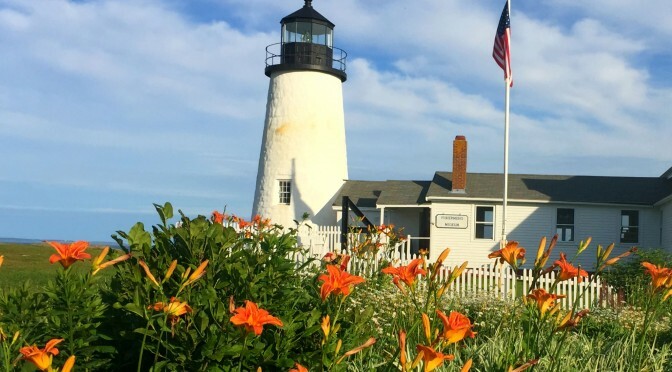 A visit to this beautiful lighthouse and the area around it is a must-see! it is the lighthouse on the Maine State Quarter, making it the first lighthouse to be featured on a piece of US currency! Coincidentally, this particular lighthouse is a top destination for weddings with its beautiful rocky cliffs and crashing waves. 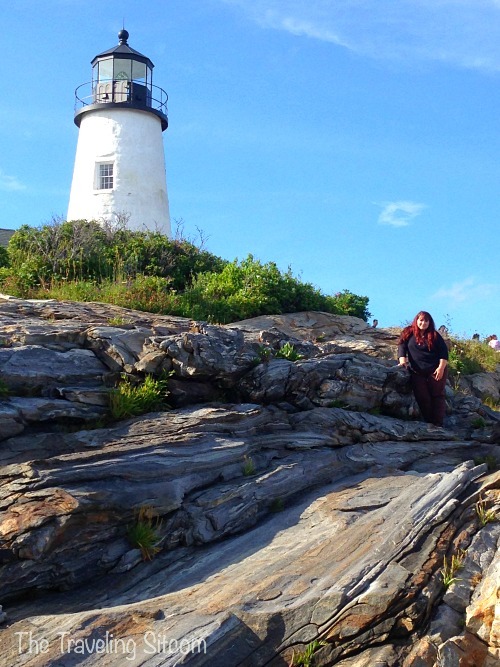 The lighthouse is one of the most photographed on the Maine coast. So there you have it! Unfortunately, the list leaves out so many things. I could talk on and on about how much there is to see and do in the area. We are currently on our way south, and are already missing it. Who knows? One day we just may return! That is the thrill of the journey, right? 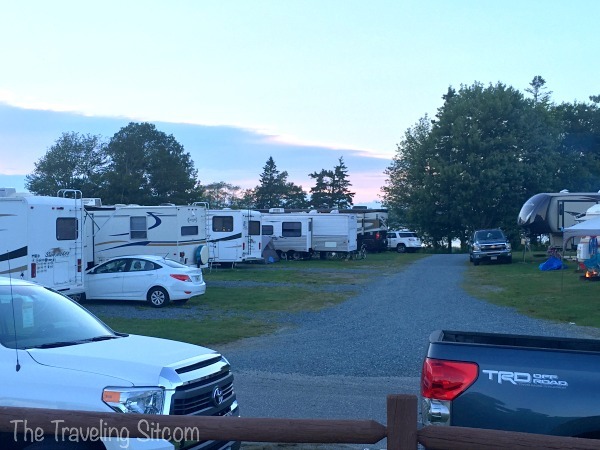 A Compilation Video of our Summer at Bar Harbor KOA! 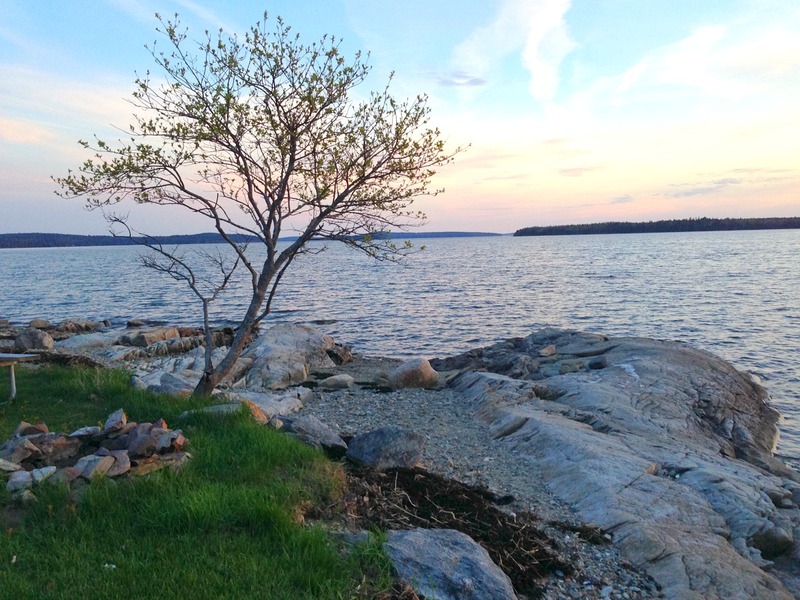 It is so hard to accurately describe how beautiful it is here in Bar Harbor, Maine. Over the past five and a half months, I’ve done my best to document some of the sights and sounds of the area. 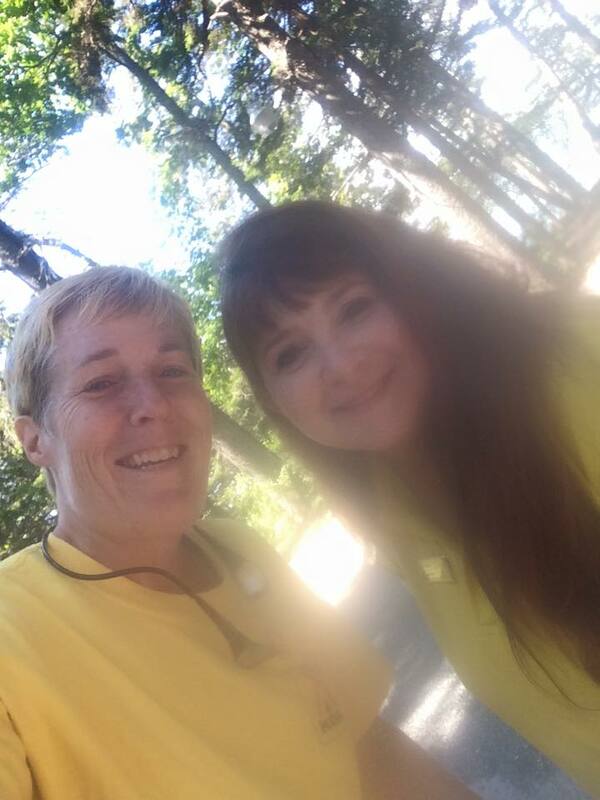 We have made so many wonderful friends here at the Bar Harbor KOA and will miss every one of them. Here is a compilation of some of the highlights of our time here along with my friends and coworkers who made the time that much more enjoyable. To view on a larger screen click here! 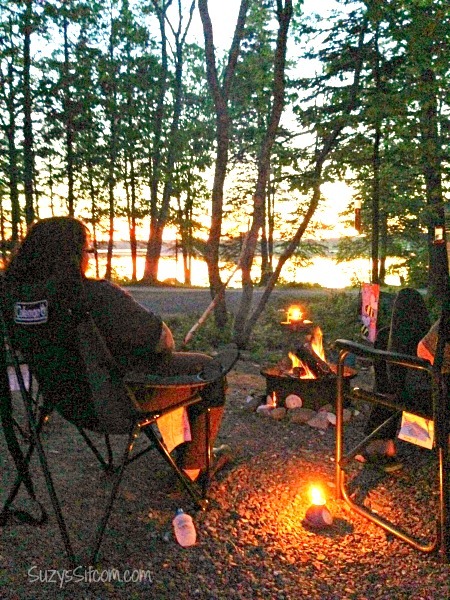 For more information about the Bar Harbor KOA, be sure to check out the KOA website! 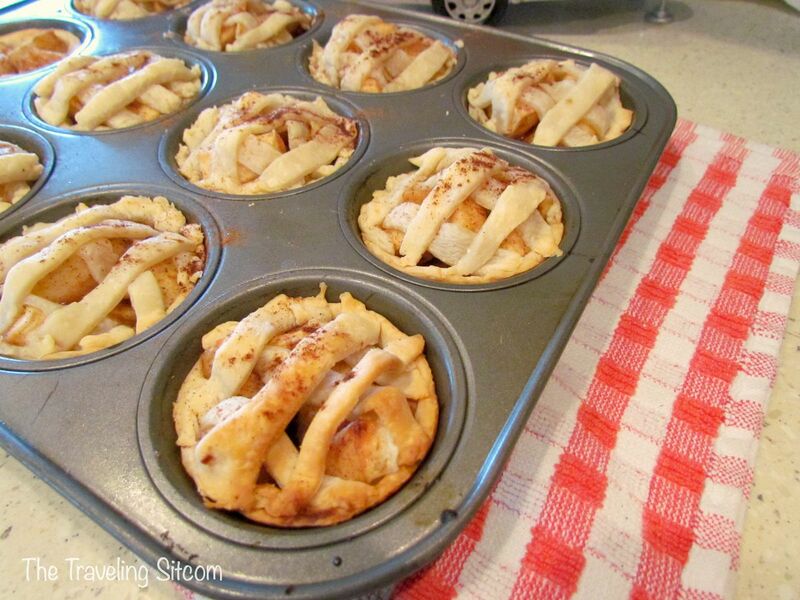 Mini Apple Pies from fresh Maine apples! 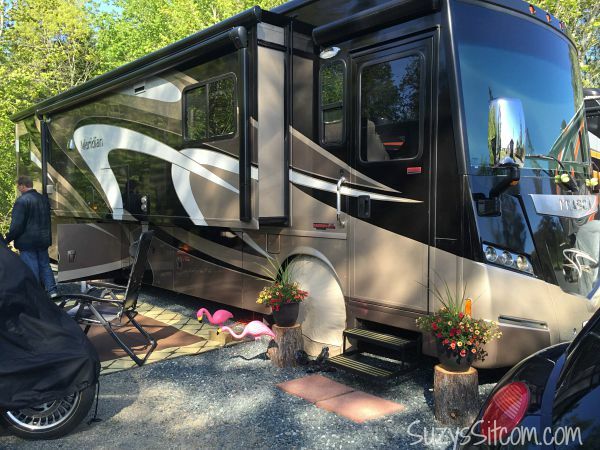 We have been living at the KOA Oceanside in Bar Harbor Maine since mid April. We will be leaving here in the next few weeks, but in the meantime, I wanted to take advantage of some of the perks that we can get from this particular campground. 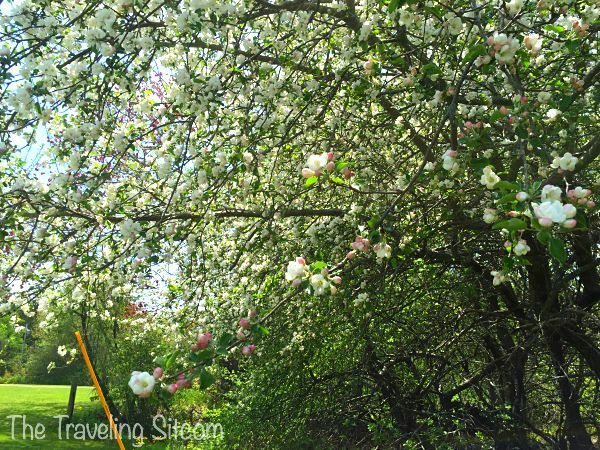 Throughout the summer, we watched the apples form. 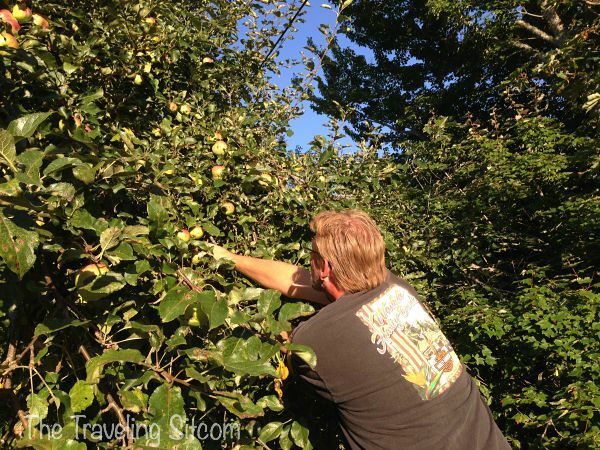 Those that have been coming here for years told us that the apples are tart and make great pies. 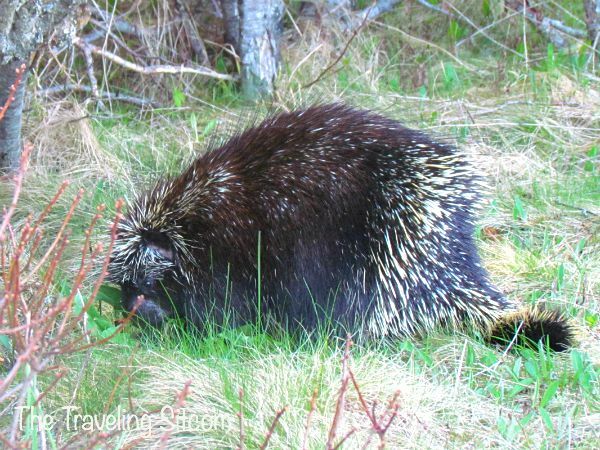 Nobody knows what type they are, but looking around on Mount Desert Island, it appears that they are everywhere! And with the coming of September, they finally ripened! 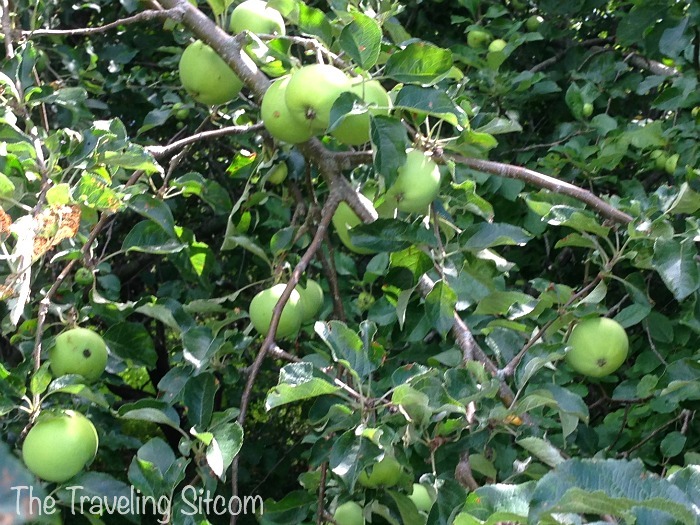 While walking the dogs near the trees, I could here the occasional “thump” of a ripe apple hitting the ground. So, I sent Dave out on a mission. Come back with a good bunch of apples and I’ll make pie! I didn’t have to ask him twice. Just look at those yummy apples! I wanted to make pie to share with all my coworkers, so I tried my hand at mini apple pies. And they turned out great! Want the recipe? 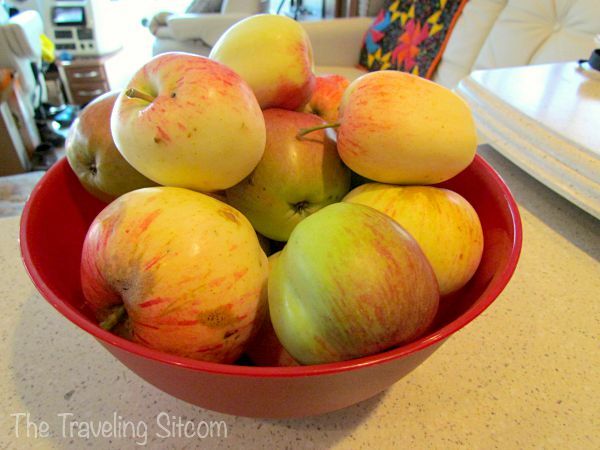 Begin by peeling, coring and dicing the apples. Drop them into a bowl of cold water mixed with 1 tsp. lemon juice. (This keeps the apples from browning). 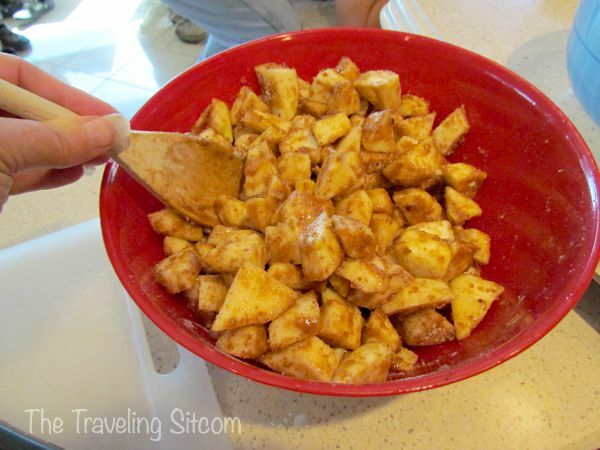 Drain the apples and add them to the sugar and spice mix. Toss to coat. 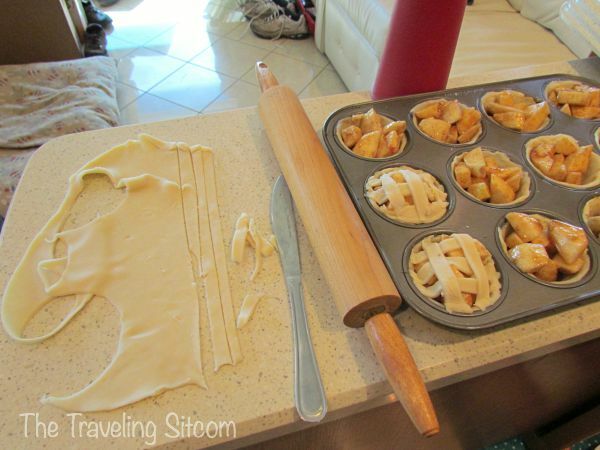 Spread out one of the pie crust and use a cup or round cookie cutter to cut out individual circles. 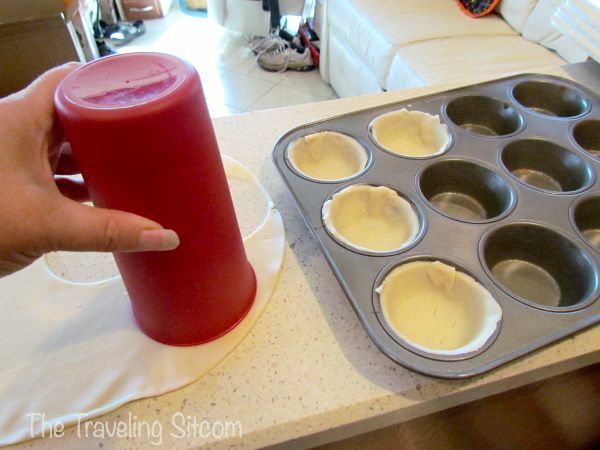 Push them into the individual cups in a non-stick cupcake pan. 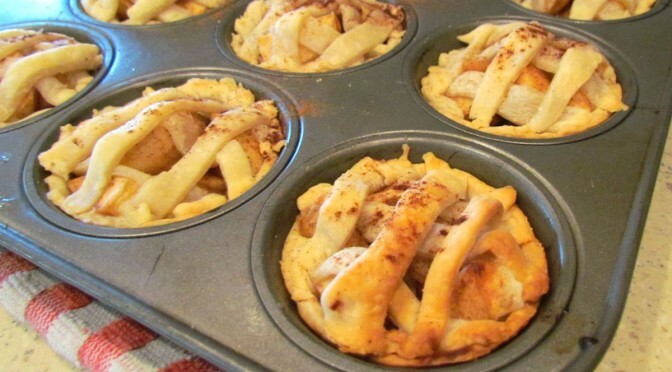 Fill each dough lined cup with apple mixture. Use the other pie crust to cut lattice strips. Lay the strips across each cup one way. Brush with egg white, then lay strips across the other way as shown above. Bake in a 375 degree oven for about 30 minutes or until the crust is golden brown and the filling is bubbly. Distribute to your coworkers and watch them smile. That’s the best part, I think. Delicious little pies that make great little desserts! 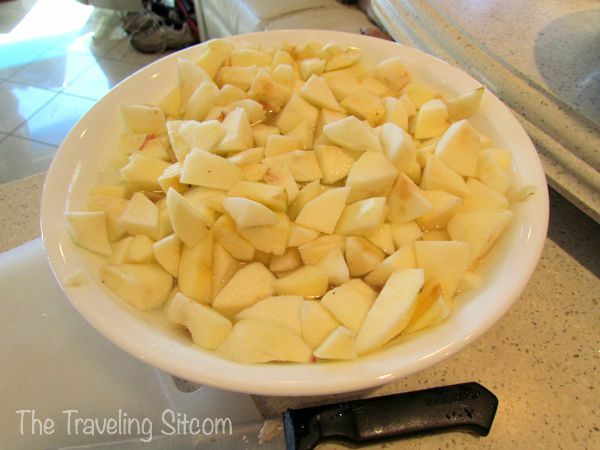 Begin by peeling, coring and dicing the apples. 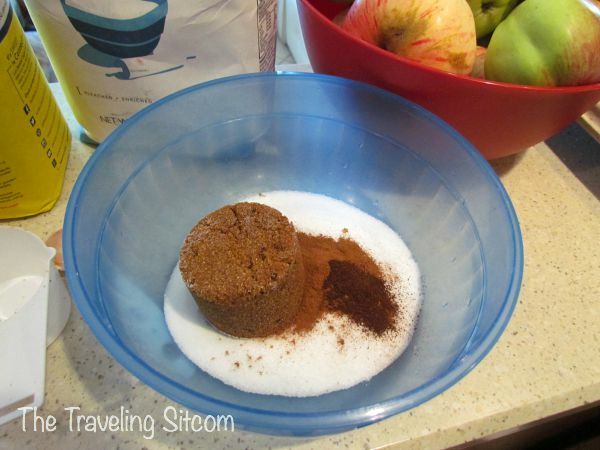 Drop them into a bowl of cold water mixed with 1 tsp. lemon juice. (This keeps the apples from browning). Spread out one of the pie crusts and use a cup or round cookie cutter to cut out individual circles. Push them into the individual cups in a non-stick cupcake pan. Fill each dough lined cup with apple mixture. Use the other pie crust to cut lattice strips. Lay the strips across each cup one way. Brush with egg white, then lay strips across the other way as shown above. Every now and then we actually get a day off! LOL! 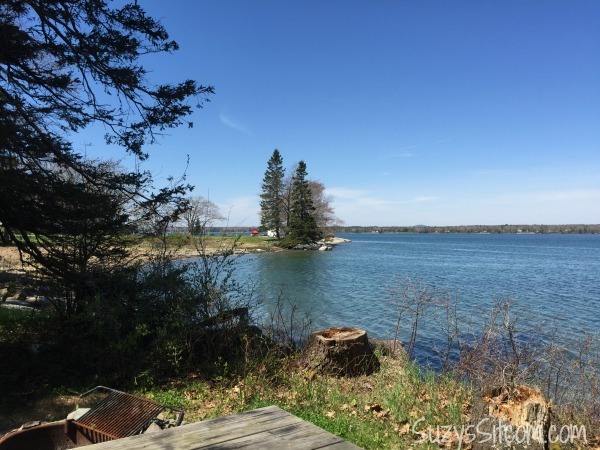 So last week we took the motorcycle out on a beautiful summer day and did the two and a half hour drive up the coast to Lubec, ME. Well, this particular town interested us for two reasons. 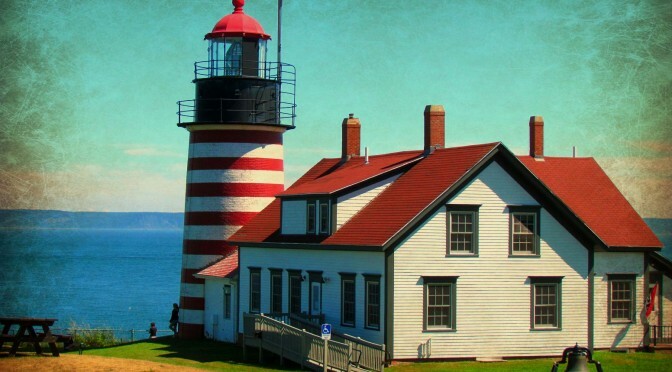 One, it is the home of the beautiful West Quoddy Head Lighthouse. 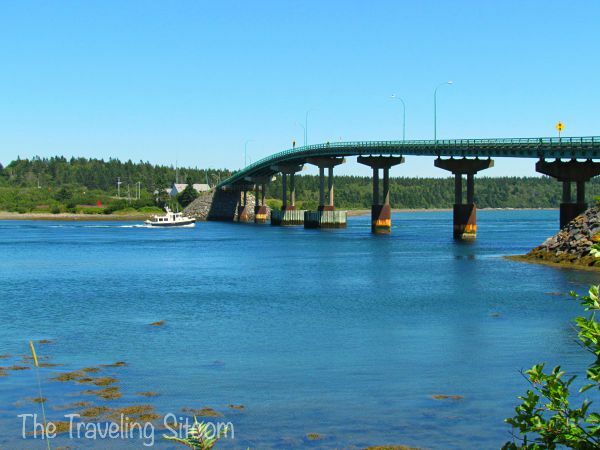 But even more interesting, Lubec is the easternmost town in the contiguous United States. Since we have already been to Key West (the southern most point); it seemed fitting! 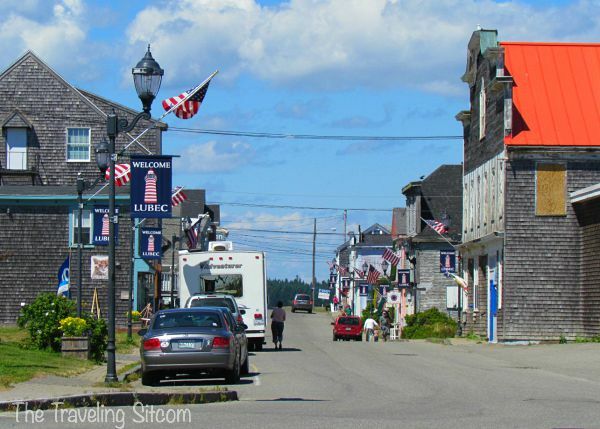 Lubec is a quaint fishing town. Small, but beautiful, located along the Bay of Fundy at the top most point of the US east coast. See that land over there? That is Canada! Unfortunately, Dave has allowed his passport to expire, so we did not cross into Canada as much as we would have liked to. On the other side of that bridge is the island of Campobello. Among other things, it is famous as being the home of Franklin D. Roosevelt. He spent his summers there as a child and used it as a summer retreat until 1939. 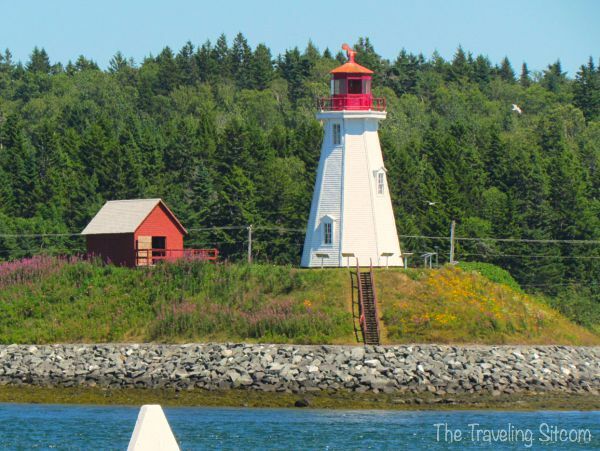 At the mouth of the Lubec Narrows, the Mulholland Point Lighthouse is part of Roosevelt International Park. Although the lighthouse is not open to the public, you are allowed to walk around the structure. (That is if you have a passport). LOL! And then we found West Quoddy Head Lighthouse! So beautiful against the backdrop of the Bay of Fundy. And speaking of the Bay of Fundy. Did you know that it has the highest tidal range in the world? The upper basins of the Bay of Fundy have peak tidal ranges of around 50 feet- five times higher than typical tides on the rest of the Atlantic coast. But we were able to spend lots of time at the lighthouse. West Quoddy Head was originally built in 1808, and automated in 1988. The 50-step iron stair in the tower is still used by the U.S. Coast Guard, which is responsible for maintaining the light. 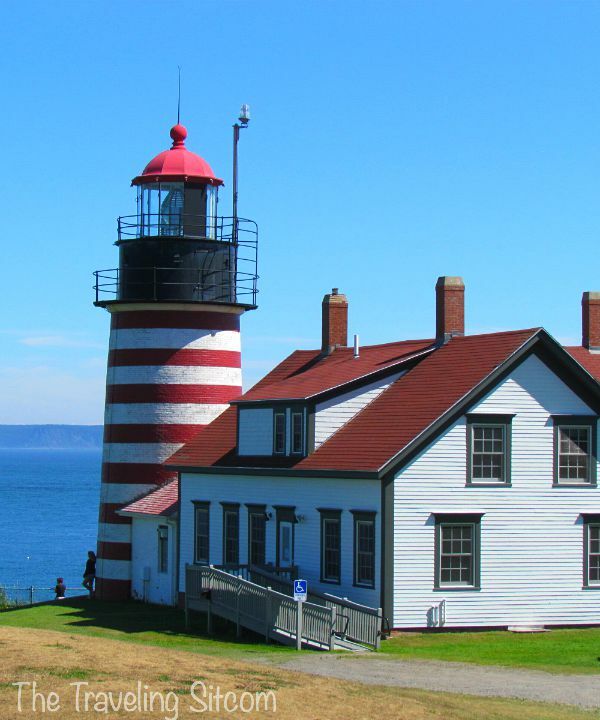 West Quoddy Head Lighthouse, overlooks Sail Rock, the easternmost point of land in the continental United States. Beautiful. Back at camp, we have been enjoying days off with our coworkers. Beautiful sunsets and good times. We are so glad we made this life change! 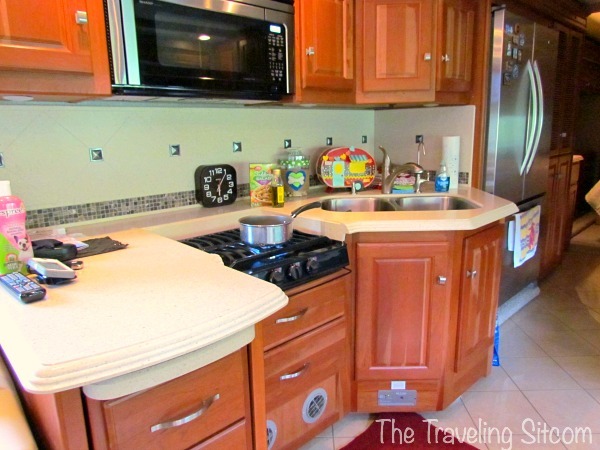 We were hired last week by St. Petersburg KOA in Florida for the winter season! We are excited to be back on the road. We will be leaving Bar Harbor in early October and heading south for the winter. This is one of my coworkers, Allison. She and her partner, Kate, have become good friends that we hope to continue to keep in touch with when we leave in October. They will also be headed to Florida, but a different part of the state. 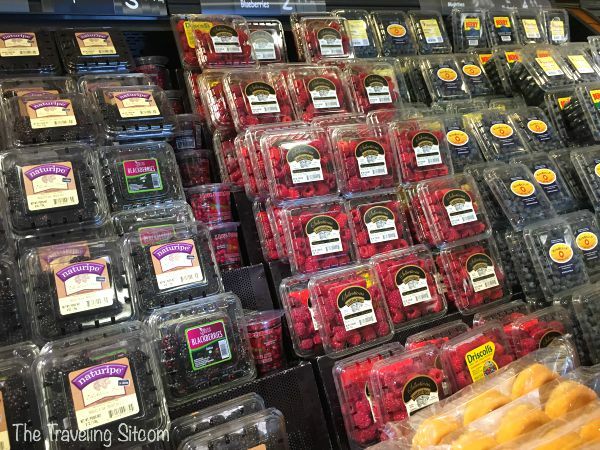 Berries everywhere you look! Soon to be fresh blueberry cheesecake and raspberry pie! I’m putting together recipes in my head as we speak! Oh wait. 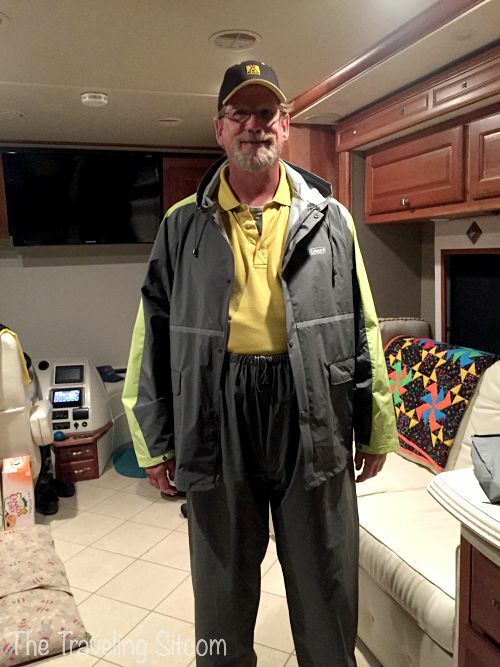 that is just Dave in his “old man” rain gear. He believes in blending in. 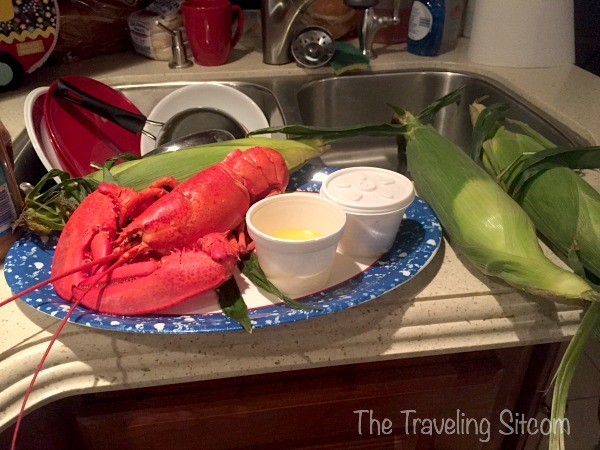 When in Maine, do as the Main’ers. Right? 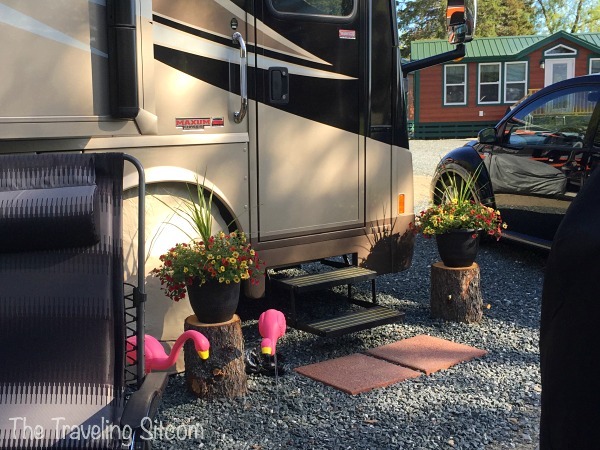 We get asked a lot about what it is like living full time in a RV. 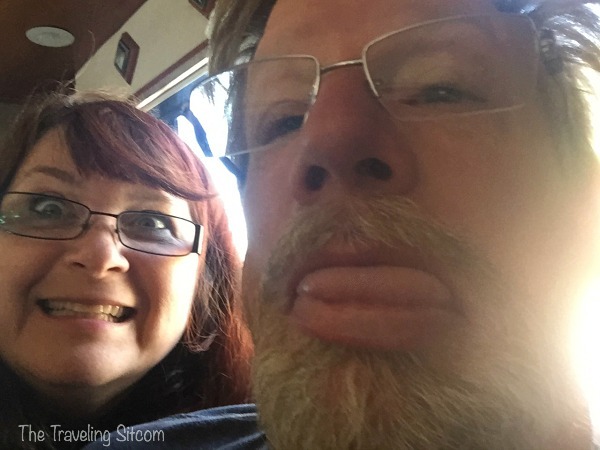 I talk about how much fun our adventure has been so far, and really it has. It is so exciting to enjoy the sights and sounds of this beautiful country. Our new lifestyle has resulted in better health for both of us, much less stress, and excitement around every corner. 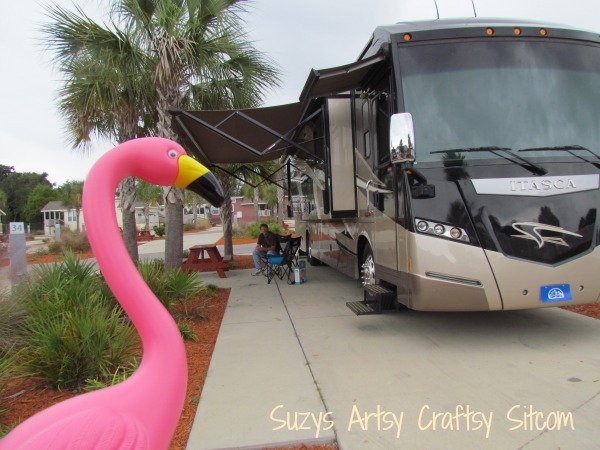 But in an effort to keep things real for those of you that might be considering this particular lifestyle, Dave and I wanted to point out a few things that are not so great about full time RV living. 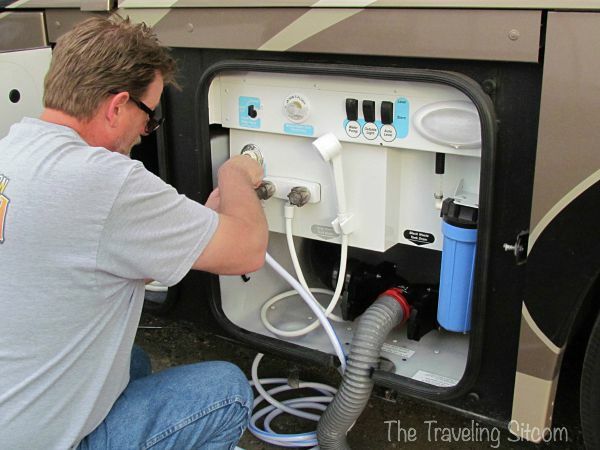 When living in a RV, one has to deal with poop on a much more personal level. Both our poop and the dogs poop. 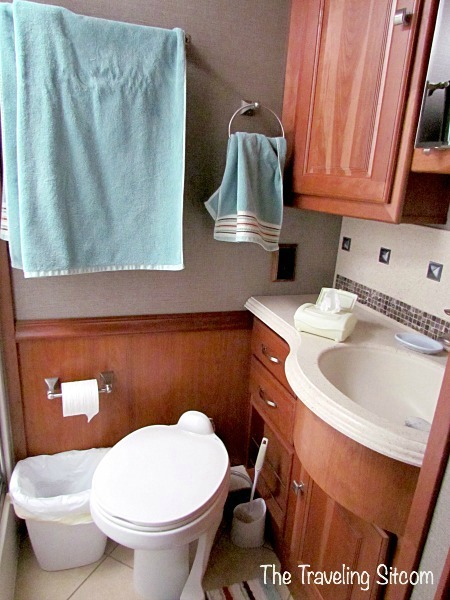 While the bathroom in our RV is definitely several steps above a port-a-potty, I have to admit that it is still a toilet situated over a poop holding tank. A poop holding tank that is full of…well… poop. We have two holding tanks. The gray water tank holds leftover dishwater, shower water, etc . The black water tank has the job of holding the poop. Every few days, Dave flushes out the black water tank with water from the gray water tank. He then adds a bit of water and a tank treatment which helps keep odors at bay and breaks down things. In general, the bathroom smells fine. But dealing with poop is much more labor intensive than simply flushing a toilet. This is coming from someone who goes on eight hour plane flights and never uses the bathroom once due to the fear of accidentally getting locked in there with all that blue water and the potential of turbulence. Heck, I cant even use the public restrooms without having to run some water in the background! While we are talking about poop, we cannot leave out the dogs. I have to say that I do miss the days when we could just put the dogs out the back door and let them do their business. Granted, walking the dogs is good for all of us. But they do need walked several times a day, rain or shine. Waking up in the morning with rain pelting the roof and knowing that I have to go out in the pouring rain and stand while Ralph takes ten minutes deciding what area he would like to pee in definitely puts a damper on my morning. Unlike Faith, Ralph took a while to get comfortable going to the bathroom on the leash. And to this day, he has to circle an area for a while before he finds the perfect spot. And whatever you do, do not watch him. He will quit in mid-poop. And then we will have to start all over again! Oh, and then there is the fun bit about carrying fresh warm poop bags to the dumpster. Yeah, I knew about this going in. 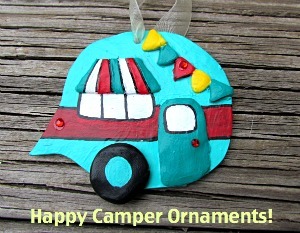 Working full time at the campground, running several websites and crafting in between, leaves me not so much time to do those things I really do not like doing in the first place. As a perpetual procrastinator, I tend to leave dishes until the last possible moment. Resulting in emergency dish washing in order to get dinner on the table. Currently, the steps to the front door go up on their own accord. Which could be a potential issue when we are ready to go to the next campsite, and they choose not to go up that day. Two televisions turn them selves on occasionally without our help- usually coinciding with the slamming of the front door. We called out the local repair guy and both the steps and the televisions worked seamlessly. Of course! The awning goes in on its own. Granted, it has a sensor that will pull it in when it gets windy. Apparently, it’s definition of wind is different than ours and if we do not shut the motor off, it rolls itself in quite dramatically while we are trying to sit in the shade with our iced tea. Last week, I went to take a shower and we had no hot water. The electric hot water heater decided not to work. We are fortunate to have a gas alternative and switched to that. When we called the RV repair guy out, the electric heater started right up. He thinks we are crazy. Uggghhh! In this part of the country, mosquitos are pretty darn plentiful. And much to my dismay, they absolutely love me. The scent of mosquito repellant is now my new perfume. While working at the front counter the other day, an errant mosquito flew in and bit me right on the nose. Much to Dave’s enjoyment, I ended up looking like Broom Hilda the rest of the evening. There I said it. 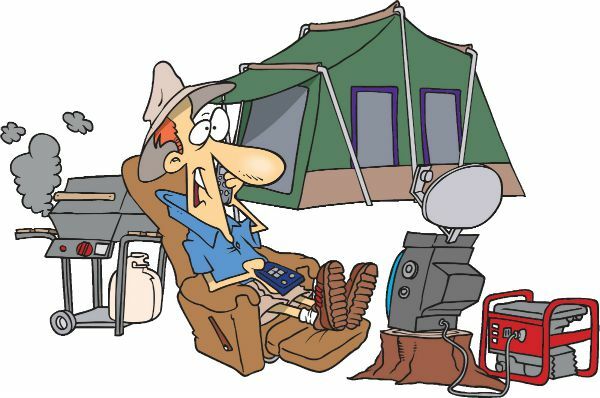 There are those that have absolutely no camping etiquette. They are the ones that park their car in the small area that you call your front yard. 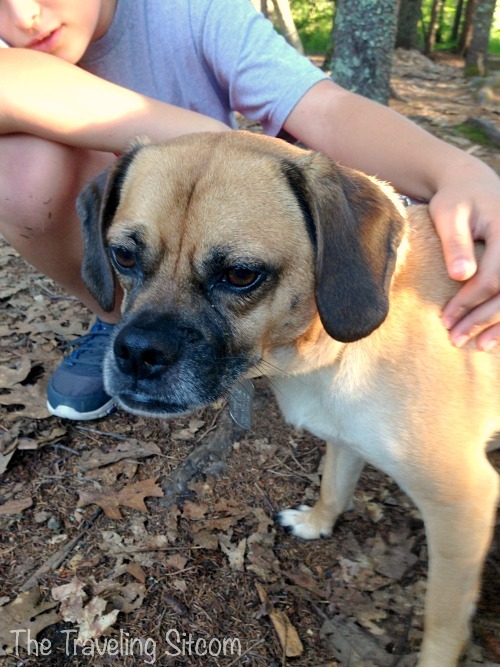 They take short cuts through your campsite, dropping trash and making tons of noise along the way, setting off both dogs into a noisy bark-fest. And then complain that your dogs are barking. Tyler Kealey plays “Mama’s got a Squeeze Box” by The Who as part of his video a day challenge in 2014. They play loud music past midnight. Sit outside playing an accordion, electric guitar, or drum set (yes, all the above has happened in the past few weeks alone!). Who the heck brings an accordion while camping? Well, somebody did last week. Not sure what they were playing, but Dave and I both had The Who’s Moma’s Got a Squeeze Box stuck in our heads for a week. Again, I knew this going in. There is not much space for crafting and I spend more time looking for my supplies than actually doing the craft. Really! I tried to be organized. I labeled many containers and stored them all over the camper. But when I am looking for one particular tool or paintbrush or fabric swatch, I spend the next hour searching all compartments until I finally run across it. Coming up to Maine from Atlanta, we encountered lots and lots of terribly maintained roads. 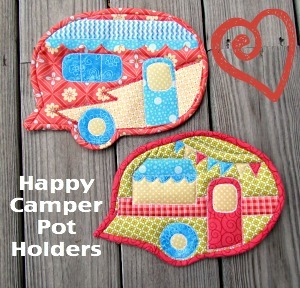 In a car, you do not notice them as much, but when driving a huge motorhome, each bump and ridge is magnified ten-fold. Dave said that I need to mention in particular, parts of I-85 North and the entirety of I-84. Our coach shook so much over I-84 that when we finally reached our destination, not only was our bedroom door entirely off it’s hinges, but only one of the televisions would come on. Unless of course, we slam the front door. So that is our top 8 gripes for right now. I have to say that for every gripe, there are ten things we love. I mean, just check out this view. How could you not love that? 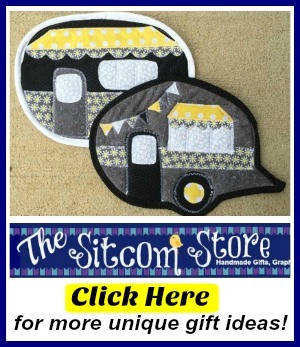 Living in a RV full time is not for everyone, that is for sure. But for us, I think it just might work! Our youngest daughter is getting married in November. 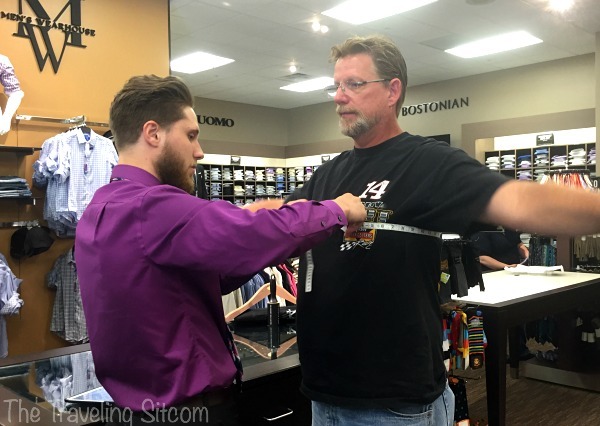 Since Dave has to walk her down the aisle, it was necessary this week to take a trip back into civilization and get measured for a tuxedo. 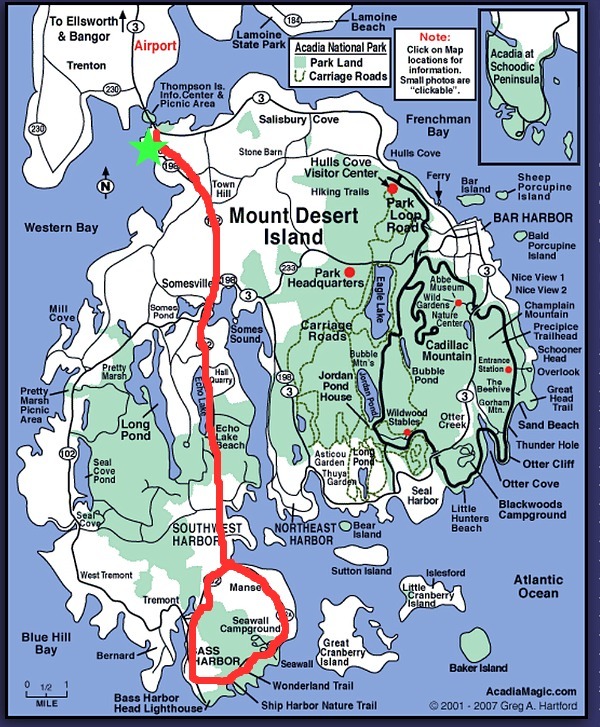 We decided that since we were in the general area, maybe we should check out Pemaquid Point Lighthouse. After all, on the map it was just east of Augusta, and a trip up the coast would be beautiful! And the lighthouse was beautiful, of course. We arrived after hours, so were not able to tour the inside, but were able to spend plenty of time enjoying the scenery. Pemaquid Point Lighthouse was originally commissioned in 1827 by John Quincy Adams and built that year. Due to poor workmanship (salt water was used in the mortar mix), the lighthouse began to crumble and was replaced in 1835. 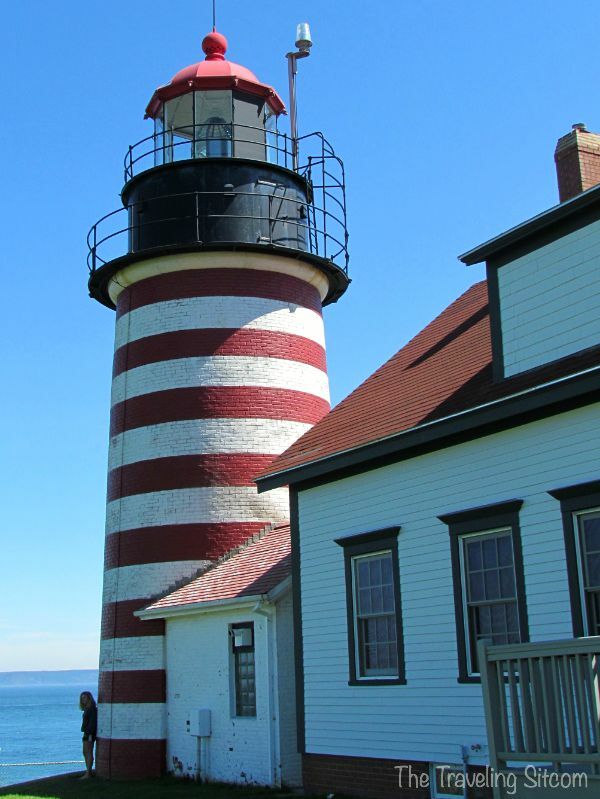 Most lighthouses in the US were converted to the Fresnel Lens in the 1850’s, and Pemaquid Point received it’s lens in1856. The lens is one of only six Fresnel lenses still in service in Maine! 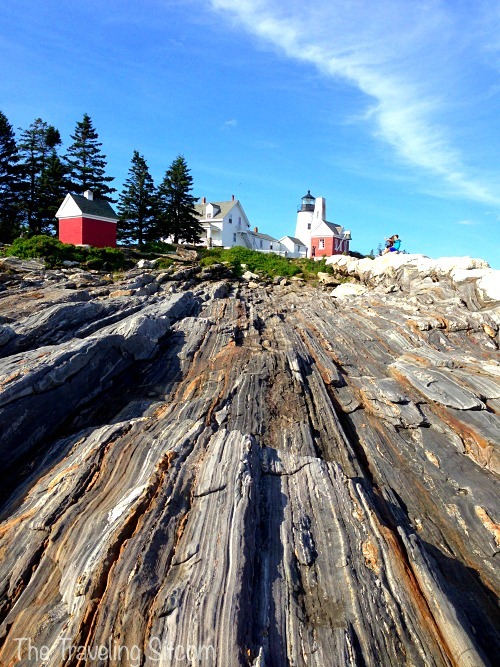 Pemaquid Point Lighthouse Park is managed by the Bristol Parks Commission. And…it is the lighthouse on the Maine State Quarter, making it the first lighthouse to be featured on a piece of US currency! While taking photos, the whole scene seemed very familiar to me. 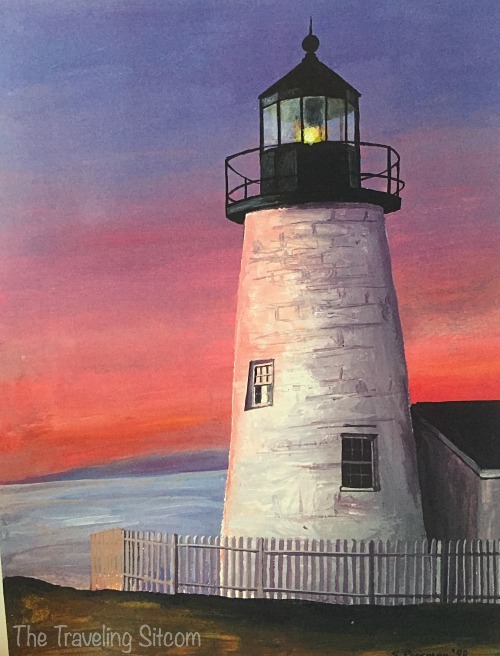 And then it occurred to me that I had painted the Pemaquid Point Lighthouse back in 1998 in a series of lighthouse paintings for a calendar! It had hardly changed at all! Beautiful rocky shores, deep blue waters and a setting sun make this trip totally worth it. We were very glad that we decided to make the stop. Our boring trip to Augusta turned out to be pretty fabulous. …and then we had to go back to work. The park at Oceanside is full to capacity and has been so since the beginning of July. The boss says excitedly that this is a record year. We are just tired. LOL! 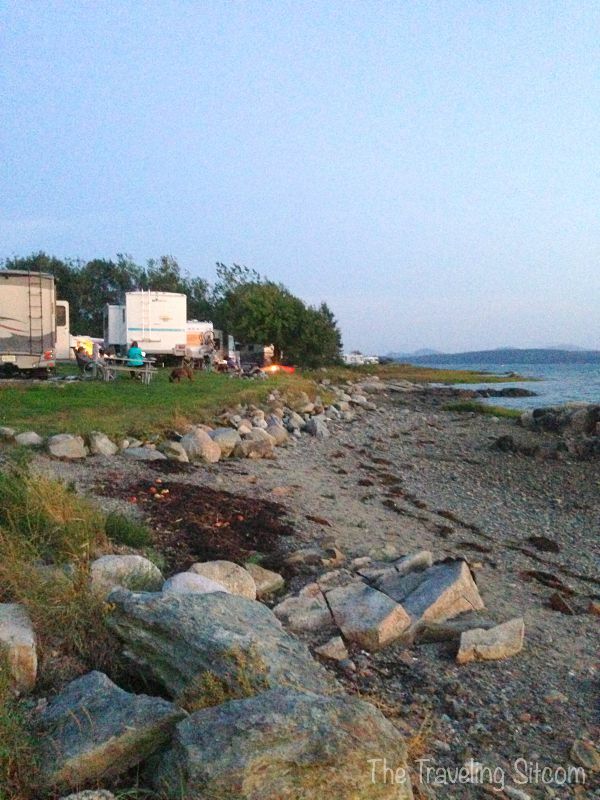 Of course, the campground still has it’s beautiful scenery to enjoy. 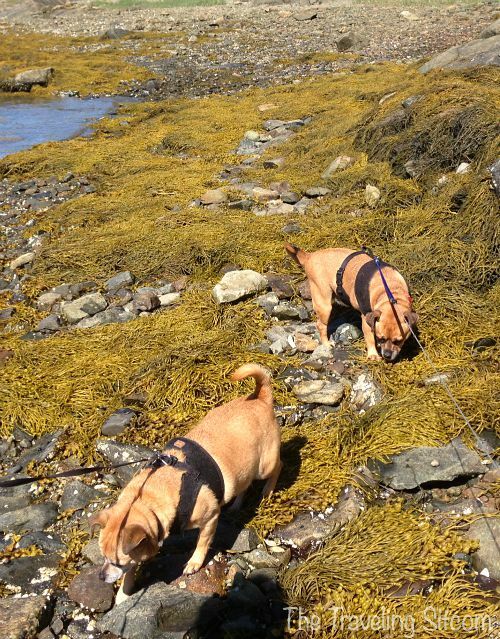 On our days off, we can wander about the rocks at low tide with the dogs and look for shells. …and rescue tiny crabs from Ralph’s mouth. 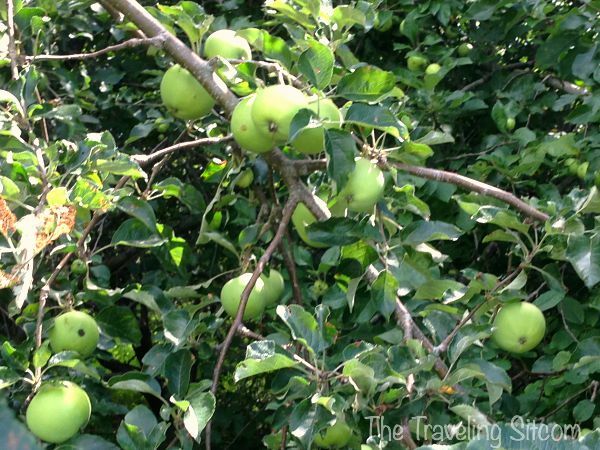 The summer here is nearing it’s end and the wild apple trees on the campground are just full of apples. I was told that they make great pie, so I am waiting for them to ripen. 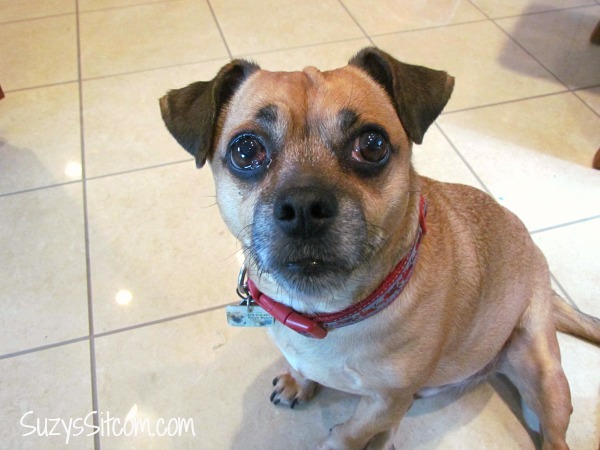 One of our guests had a dog that could have been Ralph’s twin. Ralph thinks he looks much younger and cooler, though. ….and a little morning scariness to keep it real. 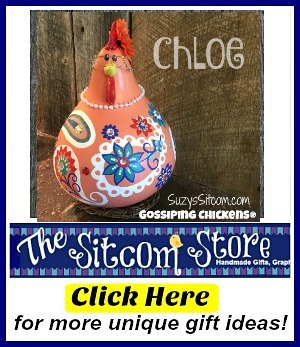 Because life is a sitcom, right? 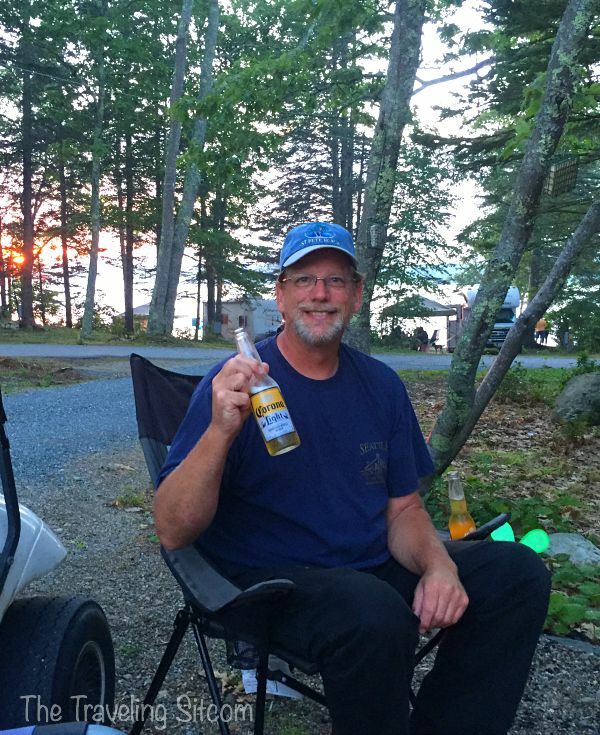 We are smack in the middle of the busy summer season here at the Bar Harbor Oceanside KOA. With 50 to 70 check-ins a day, Dave and I have found ourselves working long hours. Granted, it will slow down in about a month, but in the meantime, our schedules are pretty busy. 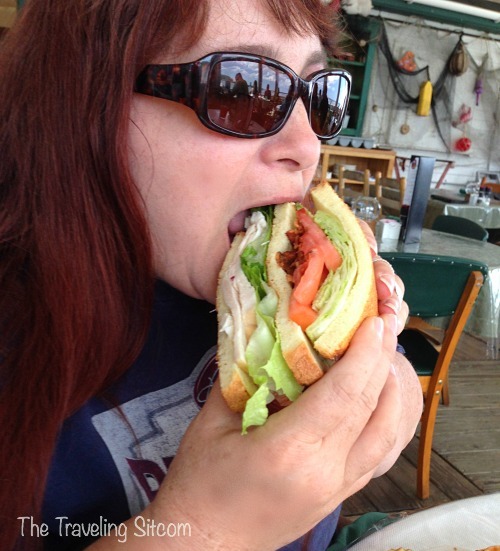 We eat when we find a moment… and some meals are just plain peanut butter and jelly. Work Kamping this time of year means dealing with crowds, tired campers, children on sugar highs, problems with guests not getting along, occasional backed up toilets, and all around craziness. I work the office and it seems that everyone shows up all at once and dealing with 10 checkins at a time, with RVs lined up as far as you can see, can be quite intimidating. Dave and I both work hard to keep the guests happy. Sometimes it is as simple as helping their children learn how to use the rental bikes, or directing a guest to our favorite restaurant. Sometimes it is much more difficult than that. There are some folks that just won’t ever be happy. We just do our best. Working long shifts means that I often end up working in the evenings and early morning on my websites. 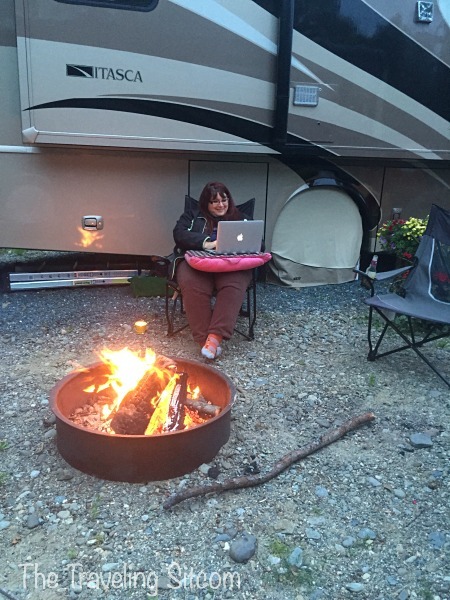 Of course, there are worse things than sitting by a campfire and writing on my website. The dogs have been doing well. Of course one main thing we had to all adjust to was the fact that we have to regularly take them for walks rather than just put them in the backyard. 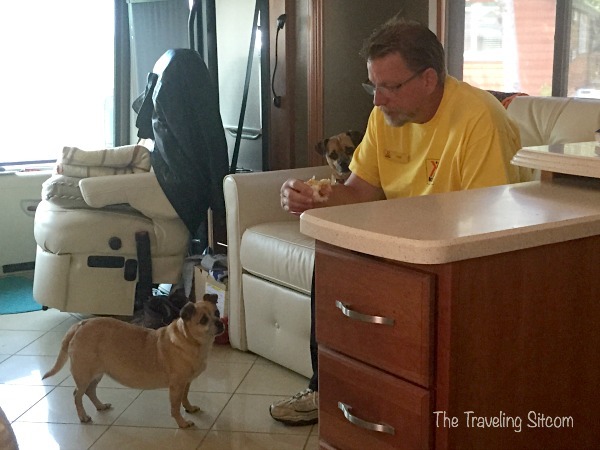 Yep, living full time in a RV means that you are quite familiar with everyone’s daily routine. Sometimes a little too familiar. So I learned something new this week. Never wrap the leash around your finger. You see, when a 20 lb. Chihuahua/Pug happens to notice a squirrel in the distance and accelerates from zero to fifty in less than two seconds flat, the finger has a bit of problem keeping up with it. 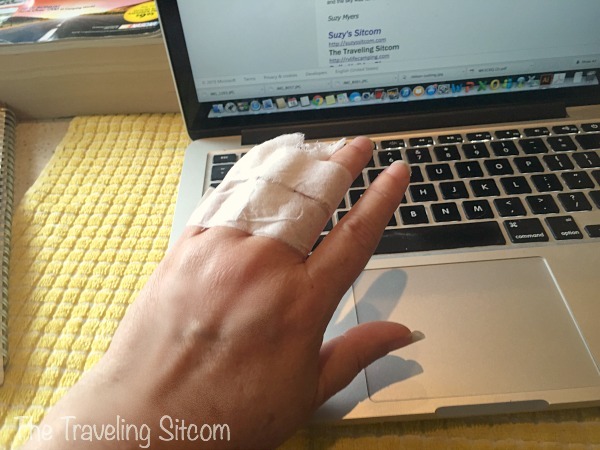 I ended up with a badly dislocated finger, and torn tendons. Oh, and my wedding rings didn’t fair very well either. Someday when I can get a ring back on my finger, I’ll have a jeweler reassemble them. Let’s just say I finally got a day off. LOL! 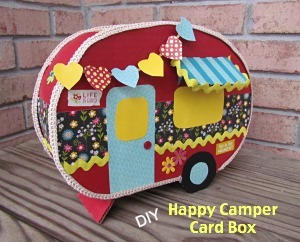 Work Kamping isn’t for everyone, and there is definitely a lot of work involved. But, there are good things too! 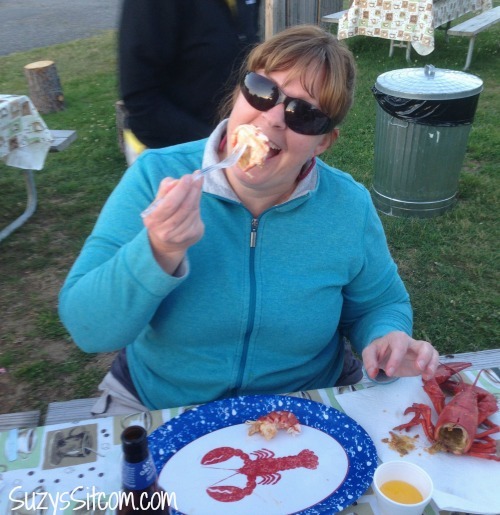 Like getting off after a long tiring day and being stopped by the Lobster Guy on site who just so happens to have a couple lobster dinners ready for you! (Ignore the dirty dishes in the photo- dirty dishes are a common occurrence during the busy season! ) LOL! 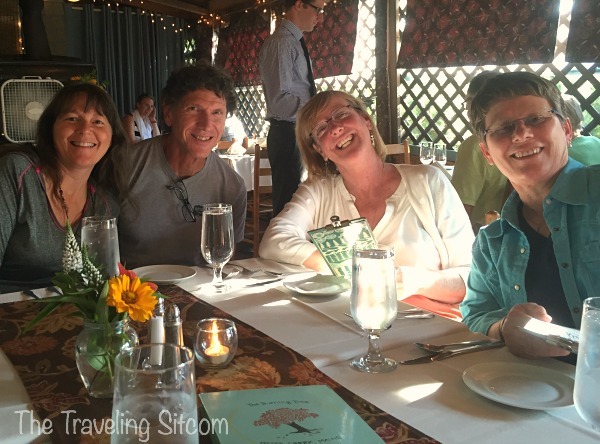 There are the times we get to enjoy a good dinner at one of the fabulous restaurants in the area with our friends and coworkers! …trying out new and delicious meals. 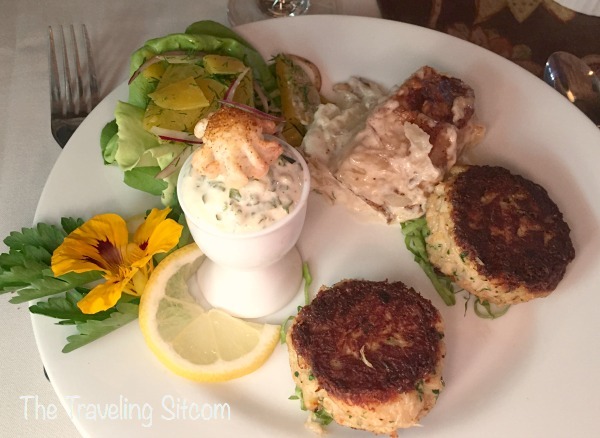 (Crab Cakes courtesy of The Burning Tree Restaurant in Bar Harbor). 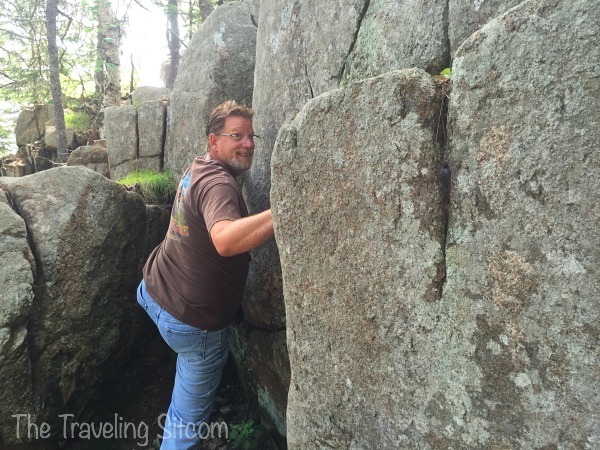 …and the fun of exploring this beautiful area of the world! 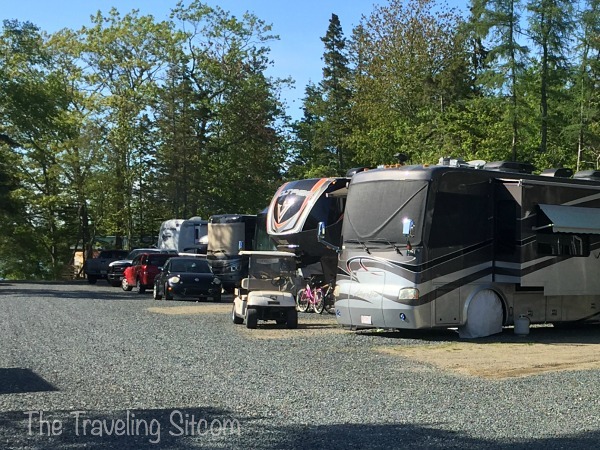 This season at Bar Harbor KOA has been very exciting for us. It is our first taste of working at a campground. While not everything runs as smoothy as we would like, we wouldn’t trade this experience for the world. 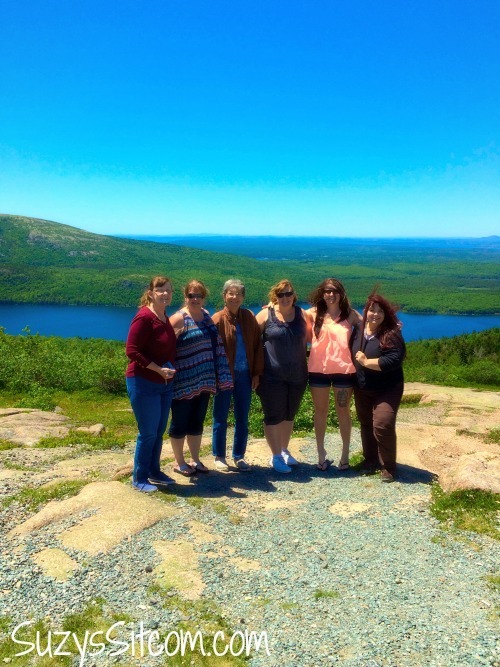 The beautiful sights of Mount Desert Island are something we will remember always. 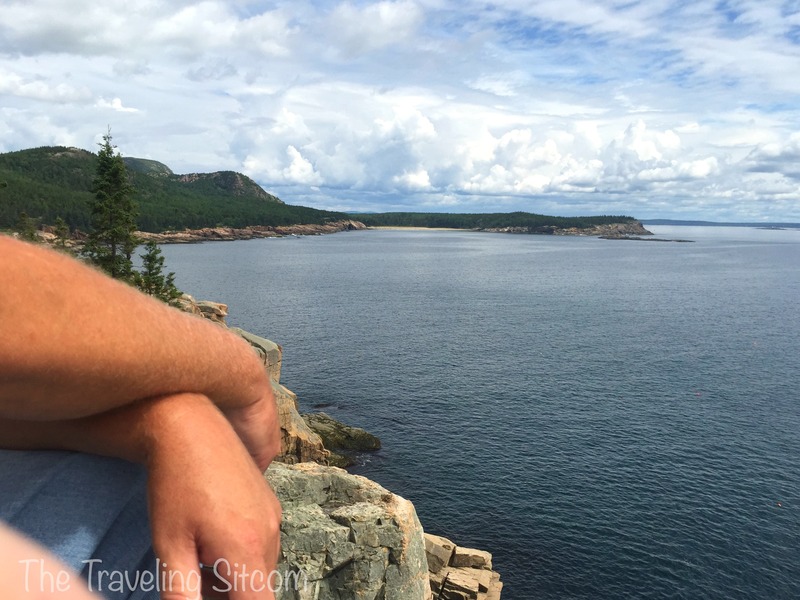 Last week, we took a break on one of our days off and hiked one of the trails along the shoreline of Acadia National Park. Rock Climbing? Well, maybe that is something we just pretend to do. The vistas are amazing here. And the journey to get here is worth the effort. We are half way through our Work Kamping experience here and will be moving on in October to our next destination. Where that is, we currently do not know. Sunrise on Cadillac Mountain and a visit with family! 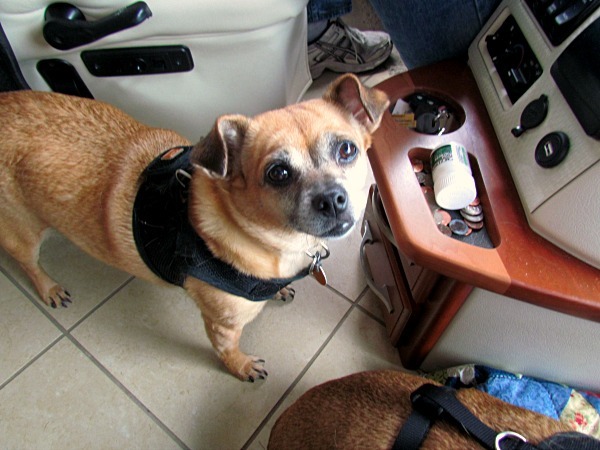 One of the hardest part of our life transition was leaving our family behind. Talking to them regularly on the phone is great, but we do miss seeing them in person. They were curious about our adventure and wanted to come visit. So this past week, we were delighted to host my daughter, mother, sister, sister-in-law and sister’s mother-in-law. It was so much fun to see them again! Of course, we had to show them around! Our first stop was the top of Cadillac Mountain in Acadia National Park. 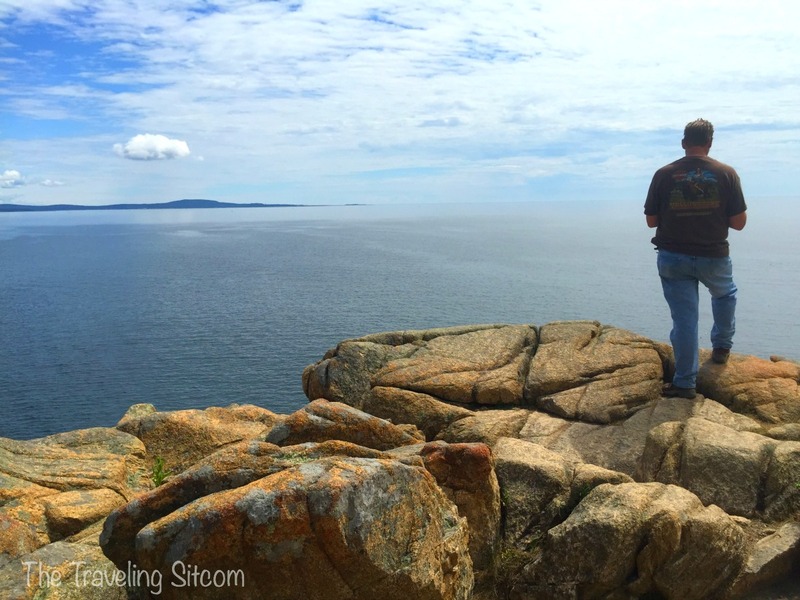 Cadillac Mountain at 1,530 feet, it is the highest point along the North Atlantic seaboard. 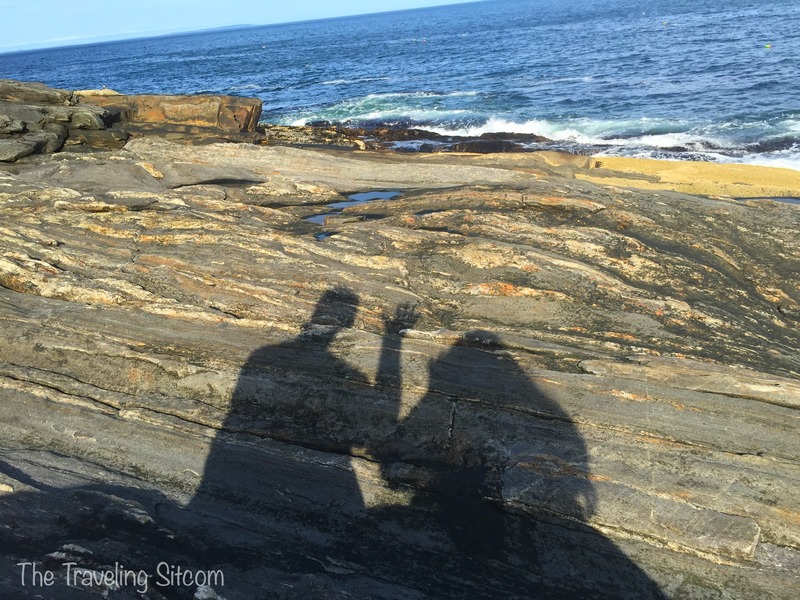 A perfect place to show them some of the beautiful sights of the coast of Maine! My daughter will be getting married in November, and we had lots of catching up to do. 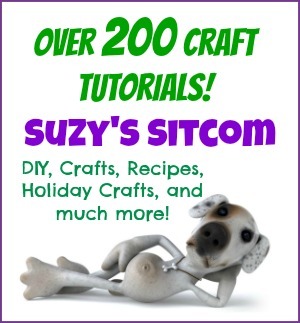 I will be creating some of her wedding decor, so be sure to stay tuned to my other website, Suzy’s Sitcom for the latest wedding craft project! Of course, she shares my sense of humor. 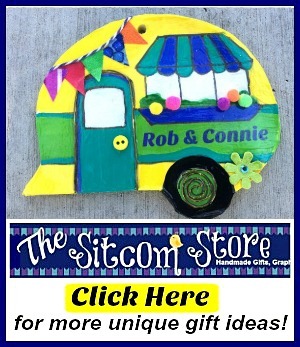 There are many reasons why we call this the Sitcom! We then took them to Hadley Point where we went mussel fishing at low tide. The Georgia brigade purchased boots just for this! Mussels can be found attached to the rocks under the seaweed when the tide goes out. This particular area has thousands of them. We let them sit in cold water and corn meal overnight to get most of the sand out of them, and then boiled them in wine, chicken stock and garlic. Yumm! 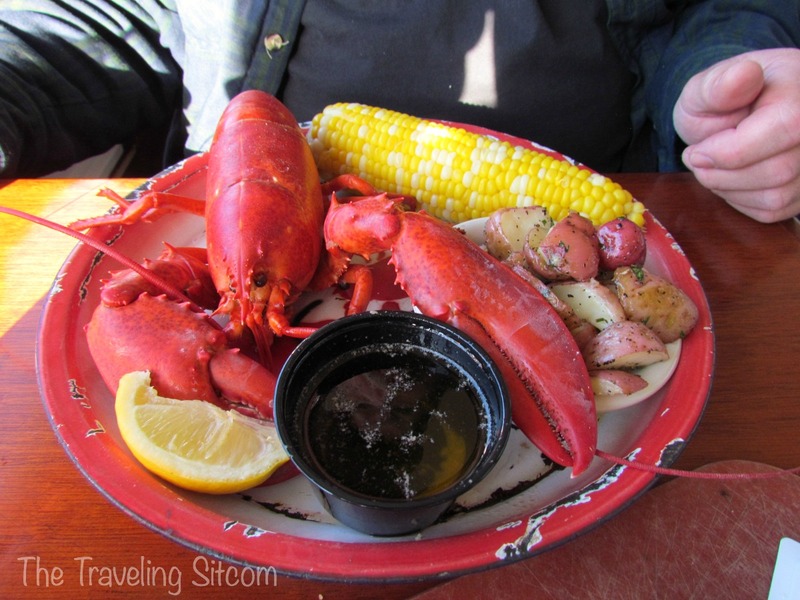 Of course, you cannot go to Maine without a taste of lobster! 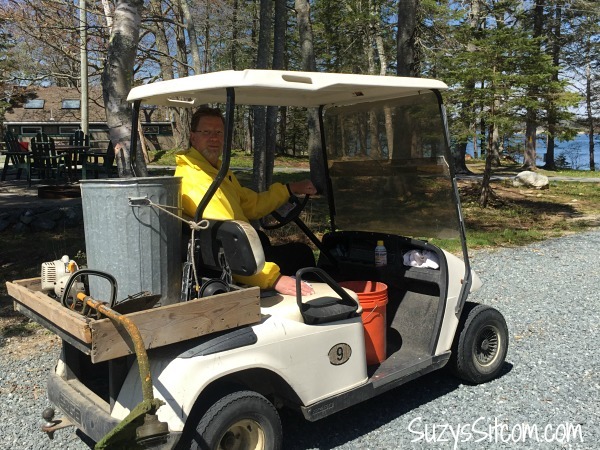 The campground that we work at, Bar Harbor Oceanside KOA, has their very own lobster man! 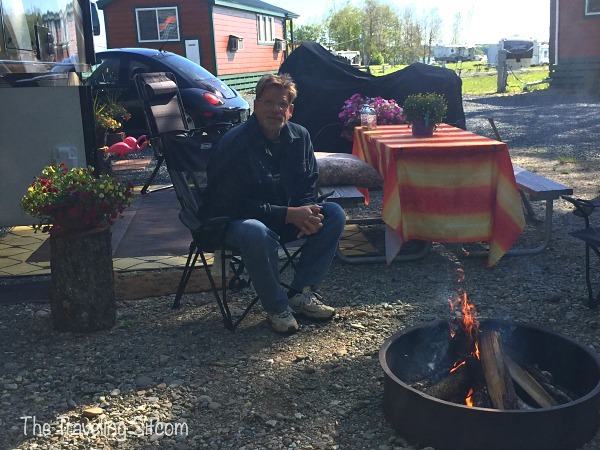 He serves fresh lobster dinners every evening from his tent in the middle of the campground. I was able to teach them my method for eating a whole lobster. (A bit of trial and error on my part). 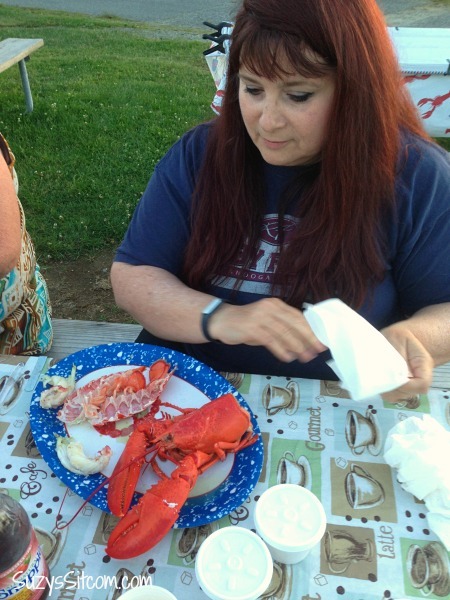 You can read the story about my ridiculous first attempt at lobster eating here. My sister caught on pretty darn quickly! 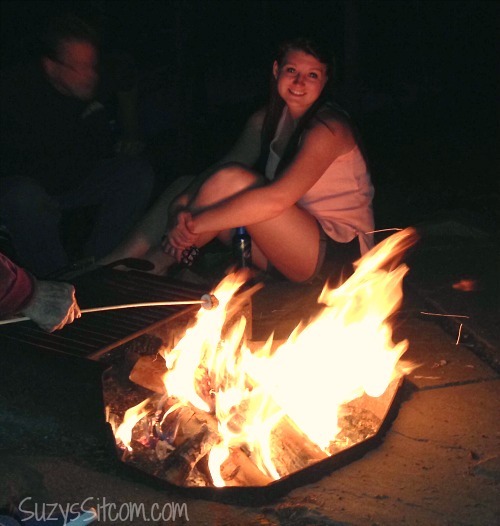 Proper s’more techniques were taught. 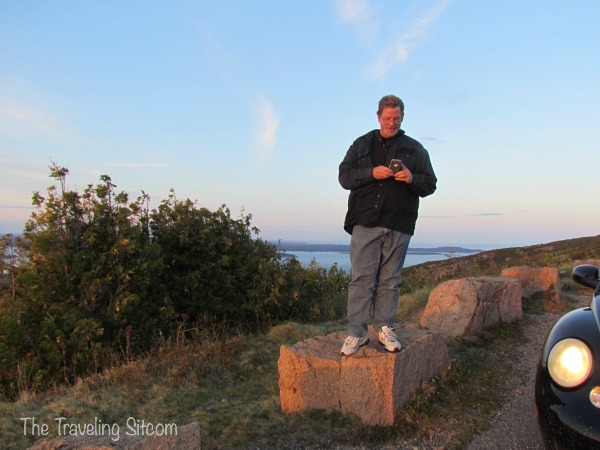 …and her last night there, we decided to go with my daughter to see the sunrise from the top of Cadillac Mountain. As I mentioned in an earlier post about checking out the sunrise on Cadillac Mountain, you definitely need to dress warm. We brought winter coats, hats and a blanket. As you can see, the hubby isn’t very good about sharing blankets. And I have a very scary looking face at 4:00 AM. It was freezing! In July! But very much worth it! What a beautiful sight! The sun begins to rise in Bar Harbor about 4:00 AM. And as you can see, we weren’t the only crazy people there checking out the view. 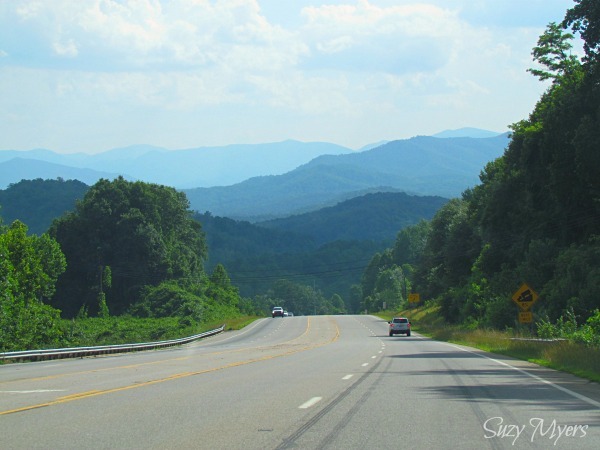 We had so much fun with the family here and were able to show them just a bit of the sights and experiences of this beautiful part of the country. 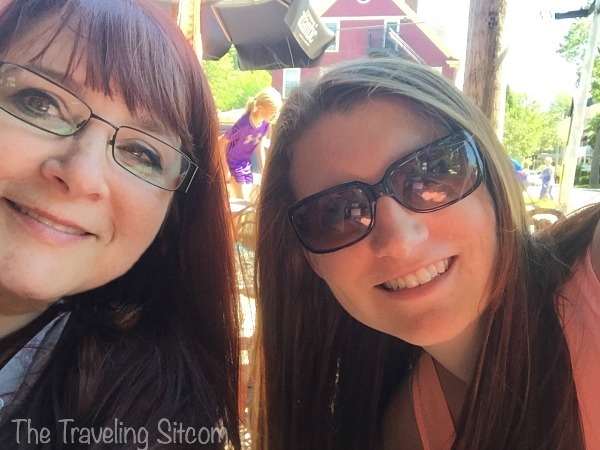 Our new lifestyle is exciting and we very much love our decision to take a chance and start traveling, but seeing the family again will be one of the highlights of our summer. 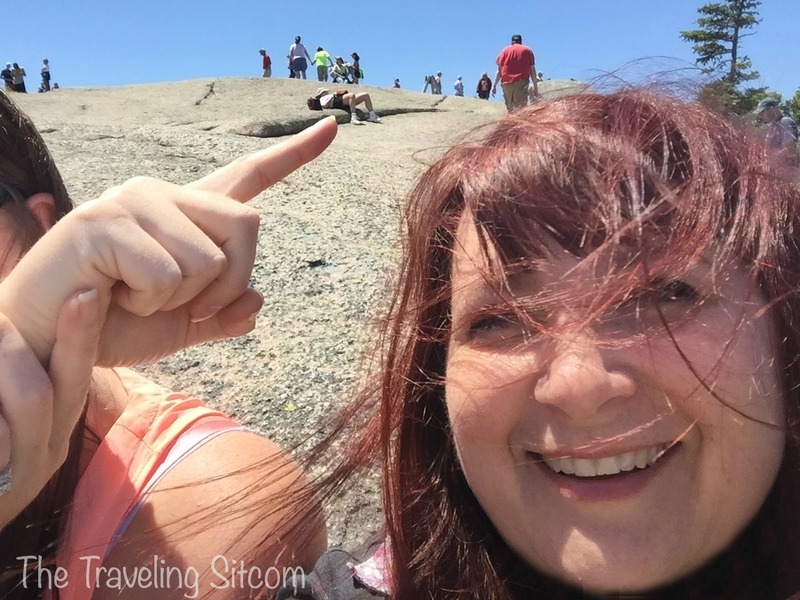 Cadillac Mountain, Work Camping, and more! 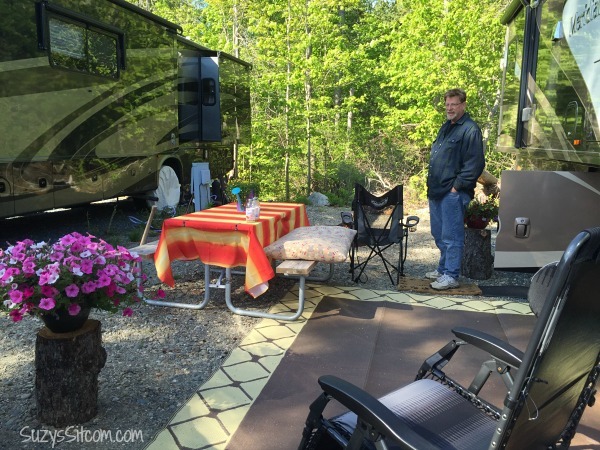 We have been in Bar Harbor for two months now, working on the campgrounds. The weather has been very different from what we are used to, with many blustery, windy days. At one point, I wondered when it would actually green up! And then suddenly the trees grew leaves and summer happened. Well, at least Maine’s version of summer. It is still chilly at night, but we now are having beautiful days in the 70’s . Apparently the trees need to work fast because they only have a few months to be green! With a few nice days of warm sun, we emerged from our work schedule and RV to create a nice front yard to enjoy. It is truly beautiful here and we wanted a nice place to sit and enjoy it! This is work camper row. We all have designated spots behind the cabins. They aren’t as green and scenic as the rest of the park, but we made do with what we had to work with and really do like our neighbors. The work camping thing? Well, it has definitely gotten more intense. We are now working close to 40 hours a week and have gotten to the point where we definitely look forward to our days off. We’ve had a few coworkers quit and move on already. Seems that work camping is not for everyone. Dealing with customer service and often physical labor can be difficult at times. We have our bad days too, but fortunately for us, the good days outweigh the bad. We have met lots of fun campers in the past few weeks- many from Georgia! And now that the weather seems to be cooperating, we are spending more time outside in the evening, enjoying our newly decorated front yard and the beautiful park. I put together a fun project last week. 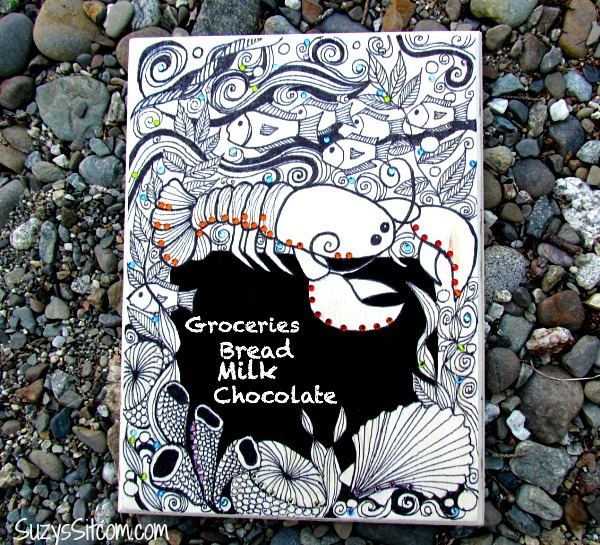 This one involves a wooden plaque, sharpie pens and chalkboard paint! Inspired by the area, I drew up of the local sea life and created a fun chalkboard. 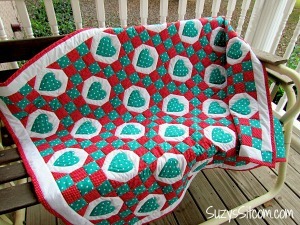 You can find the free pattern here! On the tourist level, we’ve been to Cadillac Mountain several times now. Cadillac Mountain is located in the nearby Acadia National Park and at 1,530 feet, it is the highest point along the North Atlantic seaboard. 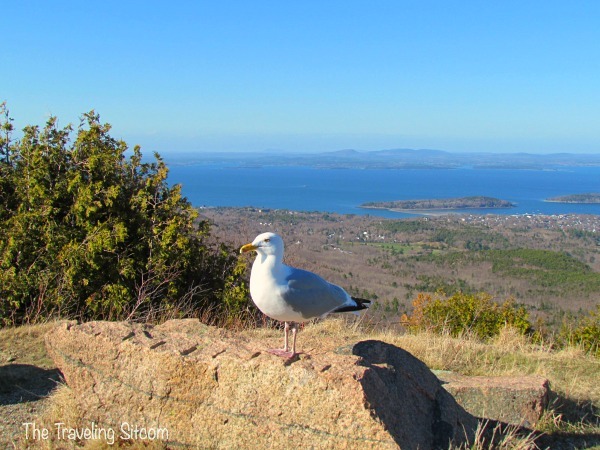 You can travel to the top of Cadillac Mountain several different ways. 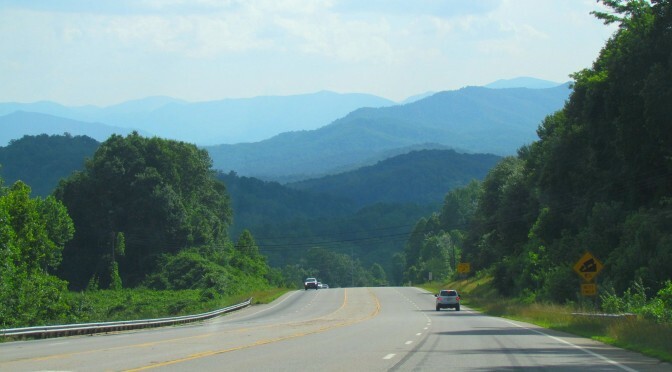 You can drive to the top in your vehicle, take several different hiking trails, or enjoy a trolley tour of the mountain. 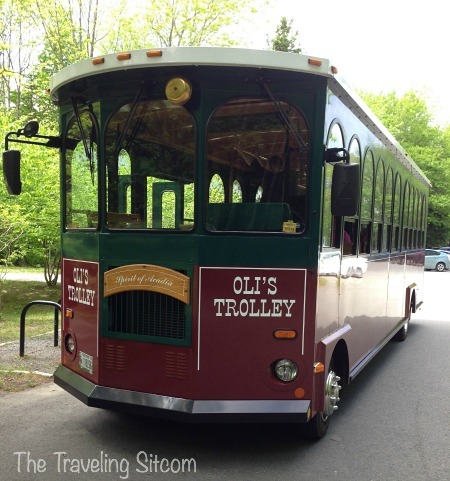 We checked out Oli’s Trolley simply because they not only take you around the area, but offer a fully narrated tour about the area’s history, historic sites, mansions, and the summit of Cadillac Mountain. This area has an interesting history behind it, and we definitely recommend a ride on the trolley to learn more about it. Amongst many other things, we learned about the great fire of 1947 that nearly destroyed all of Bar Harbor. You can still see stone foundations of mansions that used to be amongst the trees on the hillsides of the town. The area is also the home of the Rockefellers and Martha Stewart! We are told that you can take boat tours into the harbor where you can see their homes. 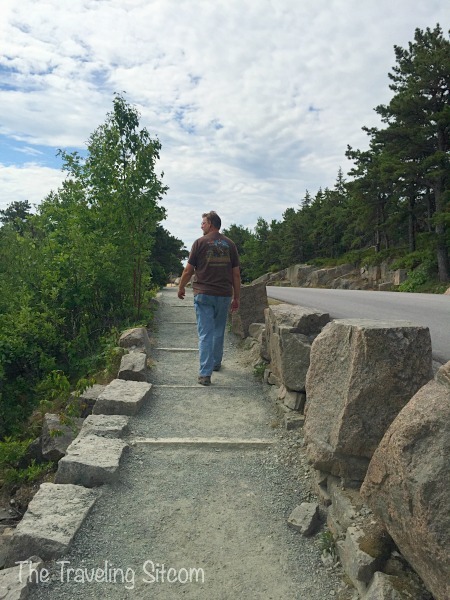 As for Cadillac Mountain, there are various hiking trails to the summit, some more challenging than others. There is also a paved road to the top. From the summit, you can see most of Mount Desert Island. On a clear day, it is a beautiful site to see! 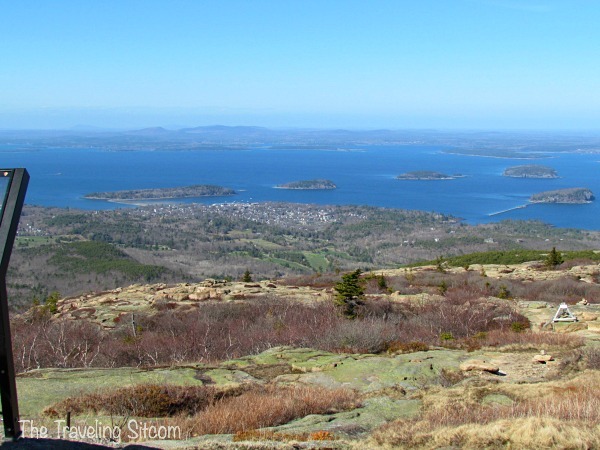 The photo above shows the town of Bar Harbor in the distance below. In this photo you can see Bar Island. When this photo was taken, the tide was out and you can see a sand bar that goes from the island to the town of Bar Harbor. Folks like to hike or even drive their cars across that bar of sand during low tide to explore the island. Timing is crucial as it is not unusual for folks to find themselves stranded on the island during high tide. For a tidy sum, boaters will rescue those that do not want to wait another 8 hours for low tide. Oh, and the little guy in the photo? That is a very ingenious seagull. He figured out that if he stands there looking all sweet, folks will feed him snack food. He waited patiently for us to find something in the car for him, and then went to the car behind us to see what they had. 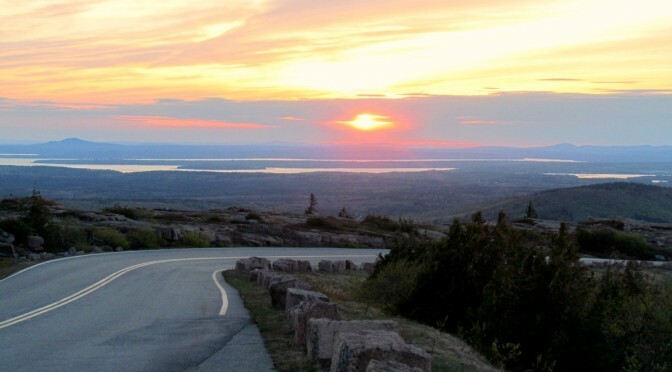 An interesting fact about Cadillac Mountain is that it is the first place to view the sunrise in the United States from October 7 through March 6. 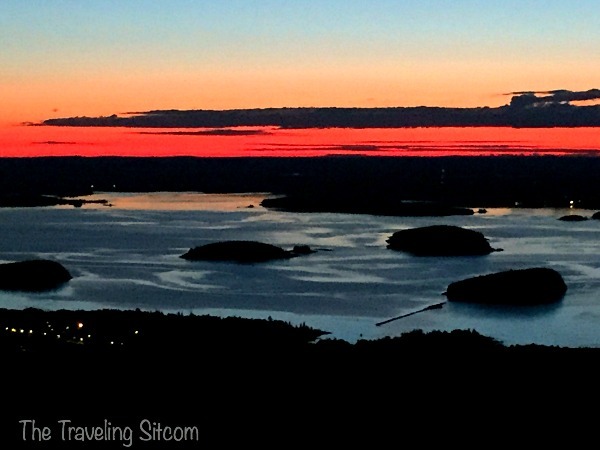 Want to view a sunrise from Cadillac Mountain? You have to get up mighty early. The sun is up by 4:00 AM right now! Check the time for sunrise and give yourself plenty of time to get up the mountain. 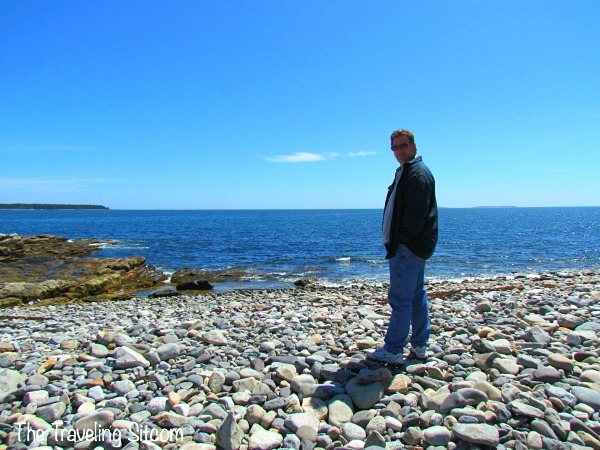 It takes about 20 minutes from the village of Bar Harbor or 30 minutes from the KOA campground. Dress warm! It is always windy on top of Cadillac and particularly chilly even in the middle of summer. 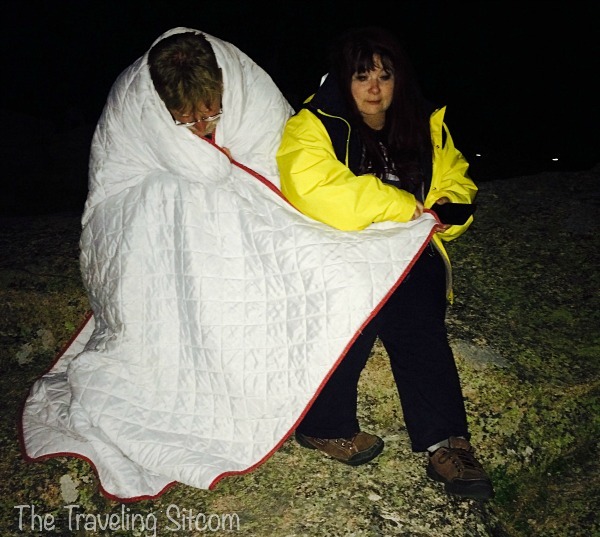 For more comfort, consider bringing blankets and chairs. Bring some coffee or tea in a thermos to keep warm. 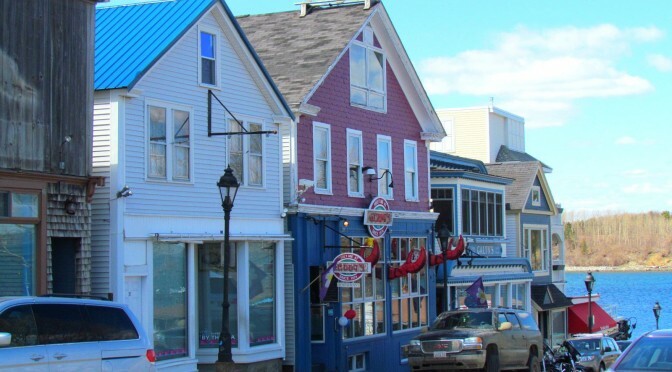 Or plan for a nice breakfast in downtown Bar Harbor afterwards. Us? Well we do not do mornings well. We may decide before the summer is out to check out a sunrise. I mean, we need to try everything, right? But in the meantime, we did drive up to the top last week to see a sunset. The sun sets about 8:00 PM right now and that worked out well for us. My camera doesn’t do it justice, but here is a brief look at that beautiful sunset. 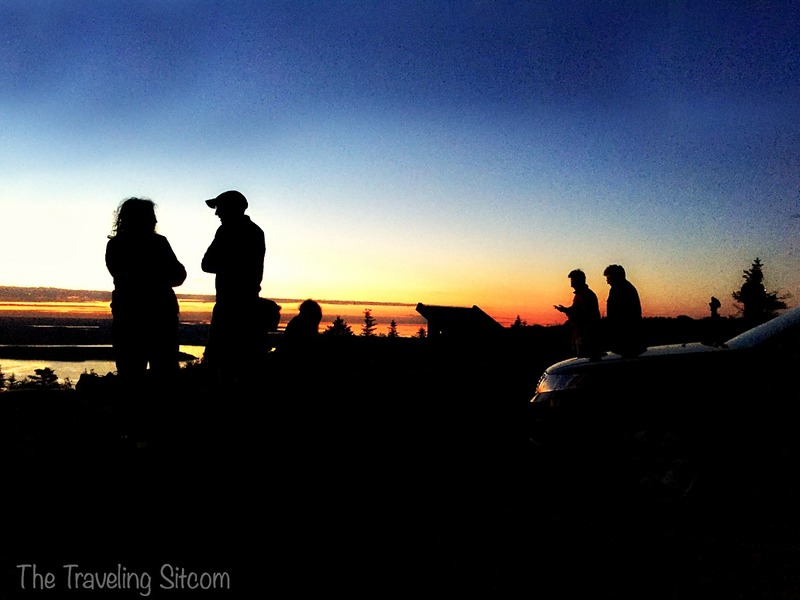 Sunsets are beautiful here both on Cadillac Mountain and at the campgrounds. I think that they will be one of the many things I will look back on fondly when we do eventually move on. Spring has finally come to our part of Maine! 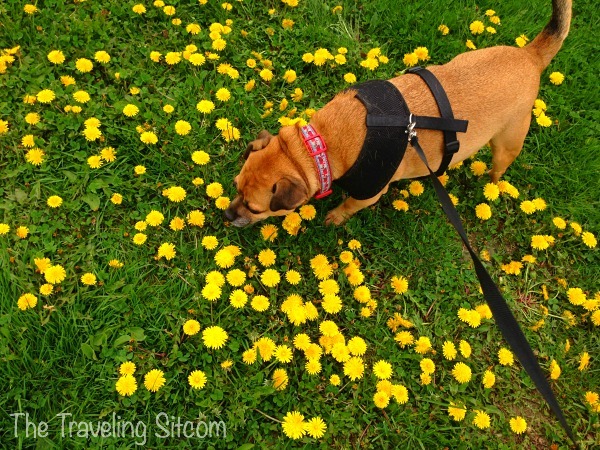 The grass suddenly greened up, the weather has warmed up a bit, and the dandelions are in full bloom! Back in Georgia, the schools have let out for summer and I’m sure it is very hot and humid there. While we are totally not missing that, it is a bit strange to be celebrating spring weather when it is nearly June. The park is starting to fill up. We had a big crowd over the Memorial Day weekend and our first taste of how busy it will get as the weather warms up here. 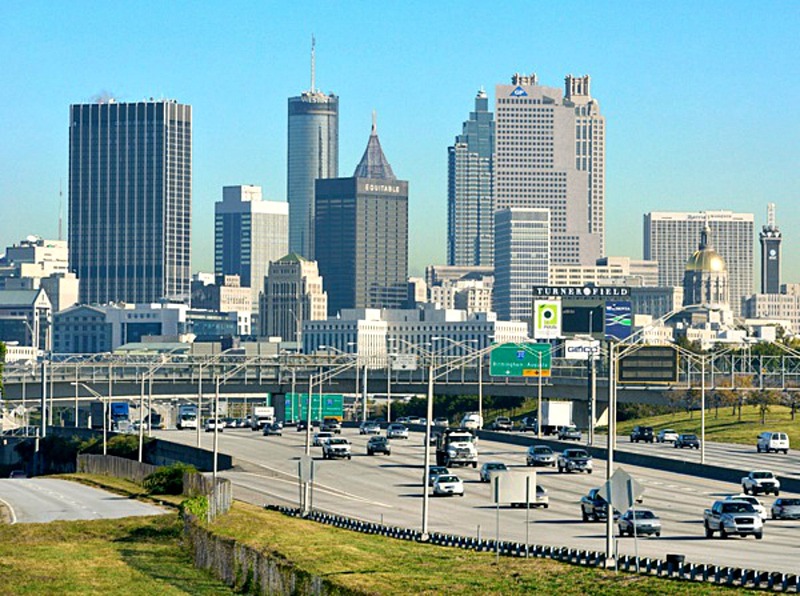 When Dave and I lived and worked in Atlanta, we carpooled every day- an hour and a half each way in heavy traffic. We still carpool, but this is our new ride! Cute, right? Takes us about 5 whole minutes to get to work and the traffic? Other than an occasional seagull or goose, it is nonexistent! We get two days off a week and plan to use them to explore the area. 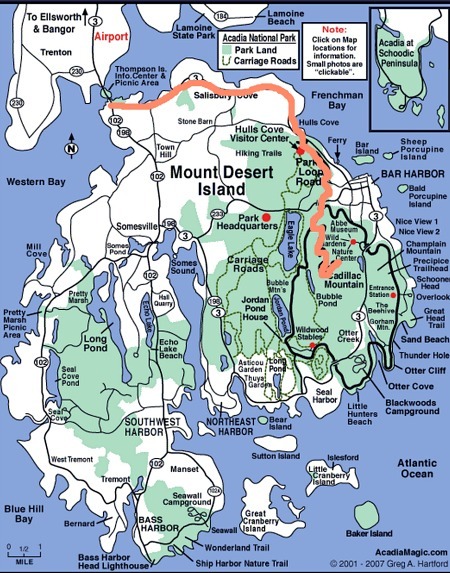 The Bar Harbor Oceanside KOA is located on Mount Desert Island. 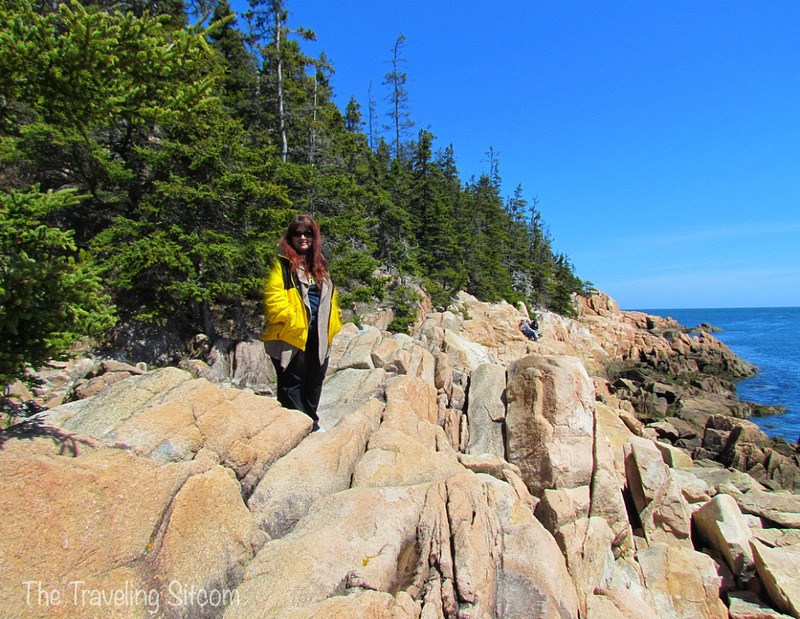 It is a huge island with lots of areas to explore including a Acadia National Park, tons of hiking trails, lots of coastal towns, lobster fishing, beautiful mountains, and even a lighthouse or two! 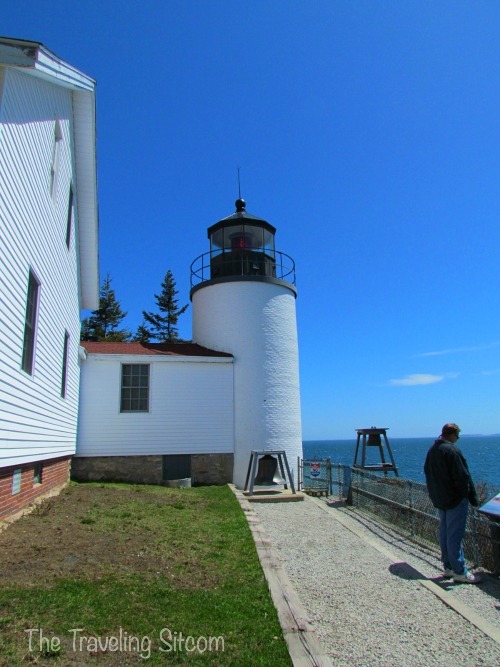 This past weekend, we took a trip down to Southwest Harbor, Bass Harbor, and the Bass Harbor Lighthouse. Southwest Harbor is the largest town on the southwestern quiet side of the island. The town has some great shops, galleries and restaurants worth checking out more thoroughly in the near future. As we entered Southwest Harbor, we stopped to admire the amazing views. You can see the open ocean here, dotted with various small islands. And just check out the rocks! I had immediate plans of gathering a bunch and creating a whole new batch of Painted Paisley Stones! …and apparently they knew I was coming. It appears that I may not be the only one who loves a pretty rock. Our next stop was the lighthouse. 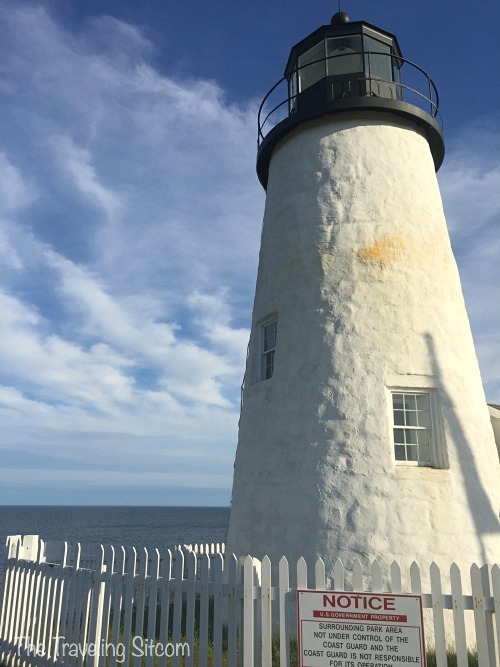 My ultimate goal on this trip is to visit every lighthouse in the area, and with nearly 60 lighthouses on the Maine coast, I have my work cut out for me! 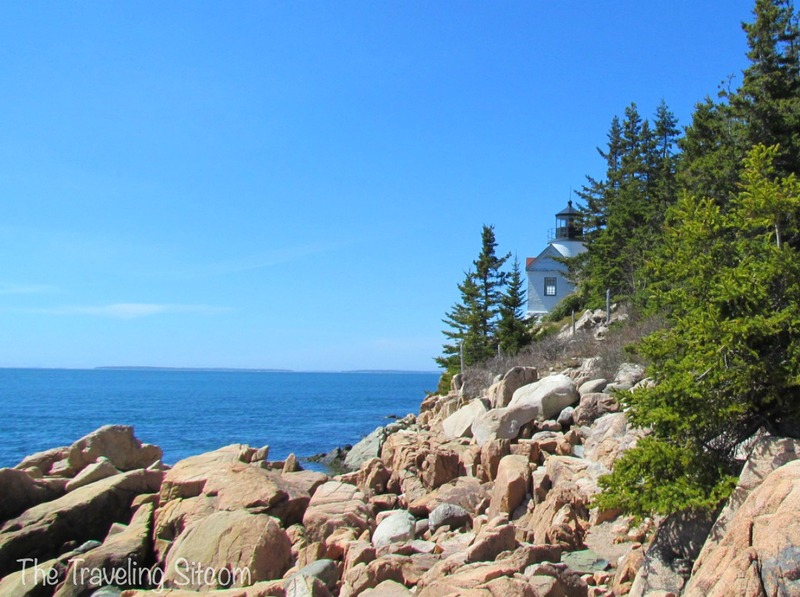 Built in 1858, Bass Harbor Head Lighthouse is the only lighthouse located on Mount Desert Island. There are not currently tours available for this lighthouse as it is maintained by a private family, but you can take the walkway right up next to the tower and lighthouse viewing area where you can see a panoramic view of the harbor and the islands in the distance. To the left side of the lighthouse is a path that leads to the rocks below where you can capture some amazing photos of the cliff and lighthouse. 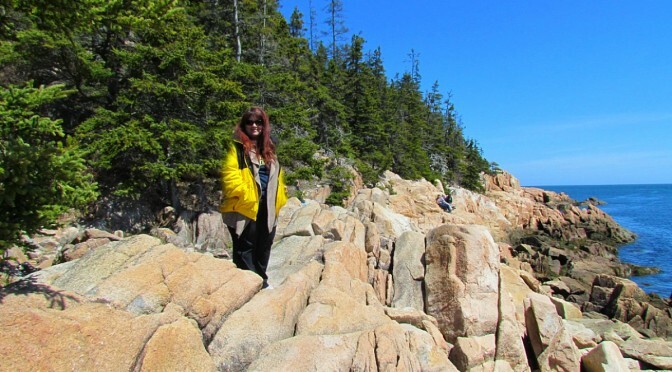 Here I am in my KOA yellow parka checking out the view before I carefully picked my way down. We sat here for quite some time enjoying the view and keeping an eye out for seals along the shore. I hope to come back here soon around sunset and get some more beautiful photos. 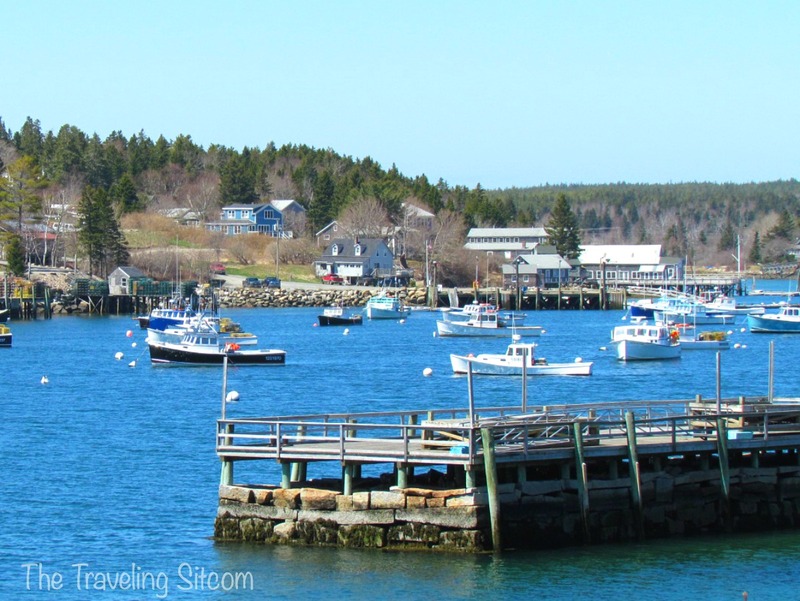 The little town of Bass Harbor is not only picturesque, but is known as one of the most lucrative lobster-producing ports in the state. The town also has terminals for two different ferries which can take you to more of the surrounding islands. We plan on taking some of the ferries in the near future and will let you know more about them then. But for now, we have work to do back at the Oceanside KOA. And a few beautiful sunsets to enjoy there!